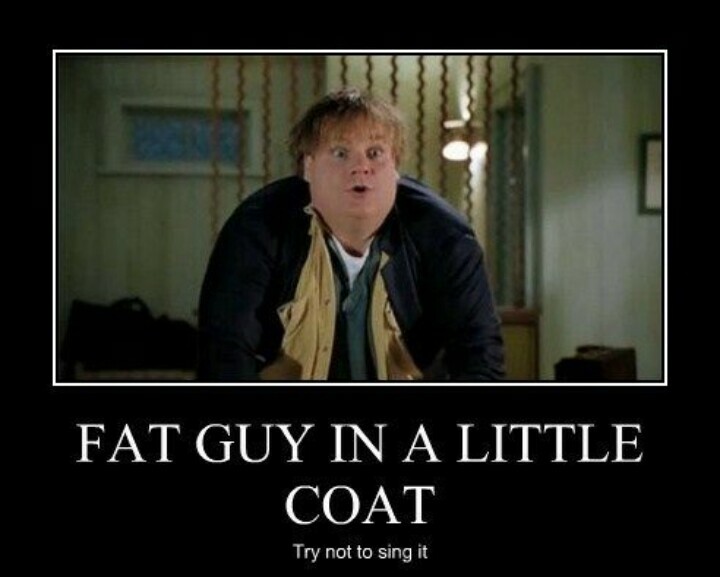 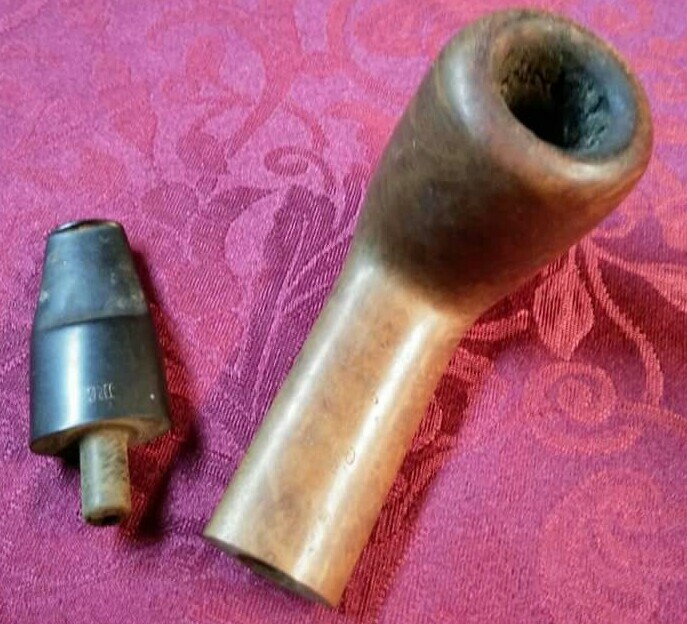 So smaller pipes would go first. 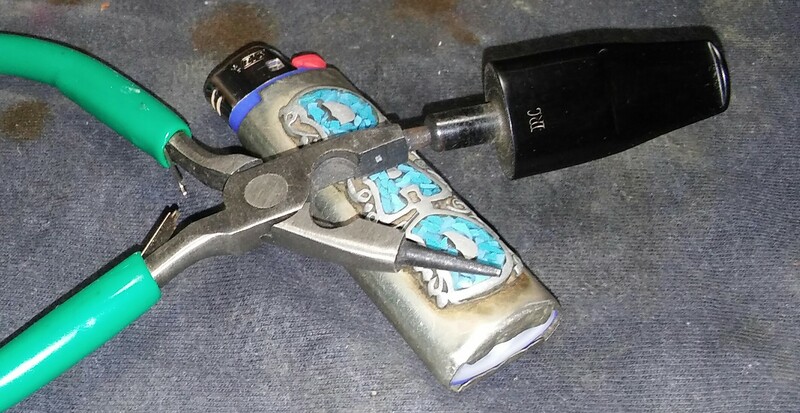 What was left was starting to grab me. 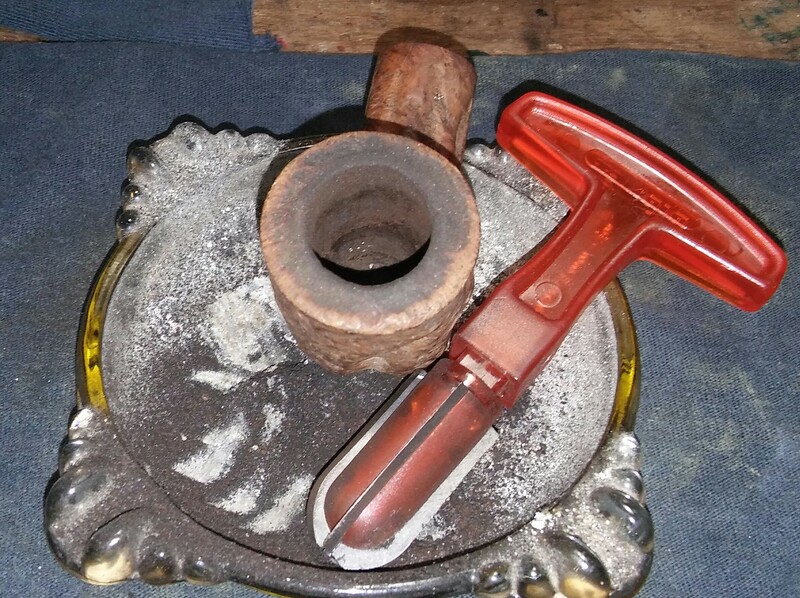 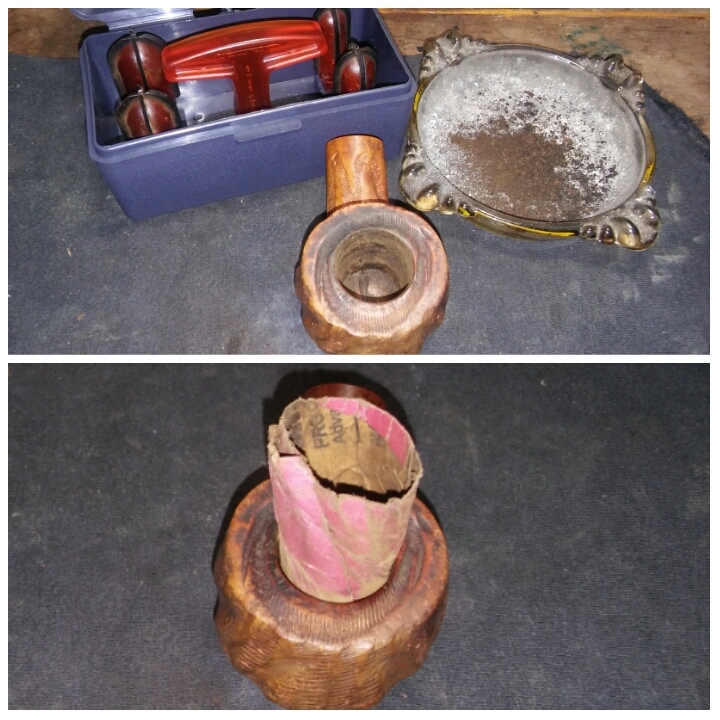 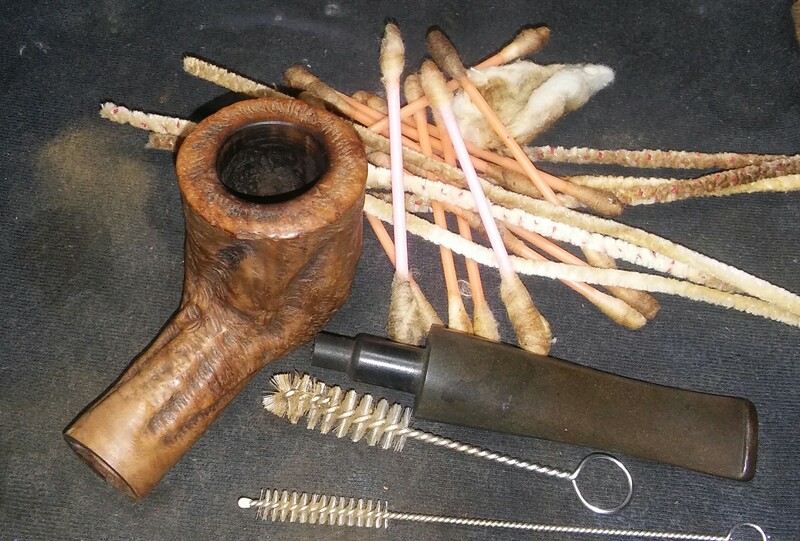 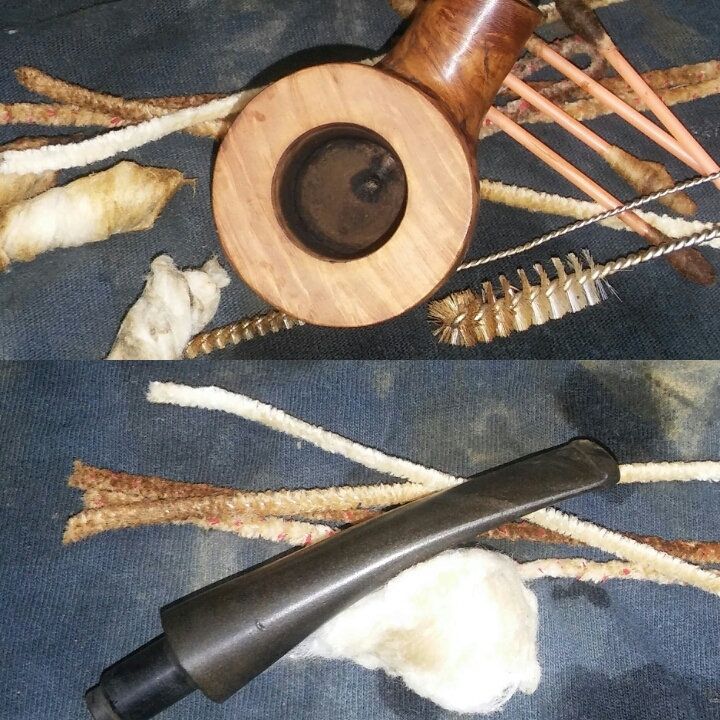 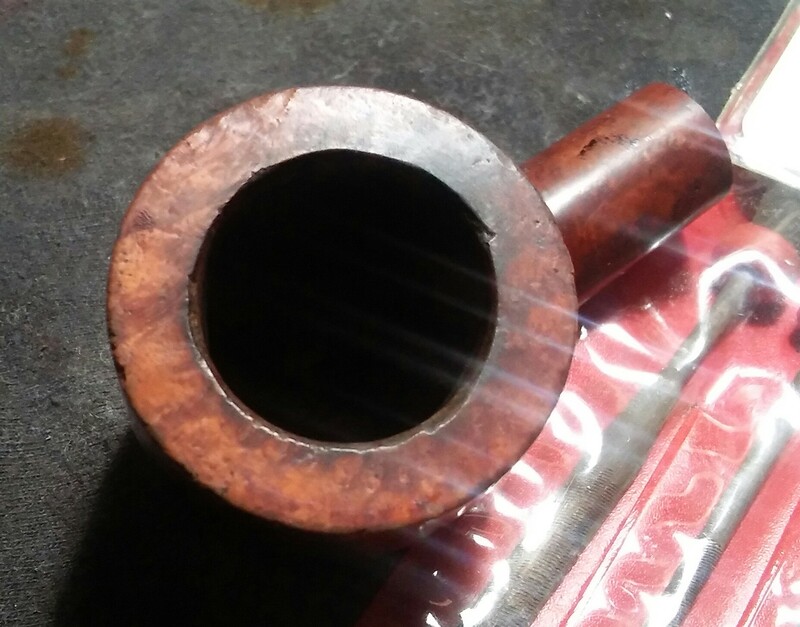 My introduction into large pipes began with Ropp cherrywood pipes, the rustic look originally sold me, being from the Adirondacks it seemed fitting but with time things loosened up at the shank and bowl. 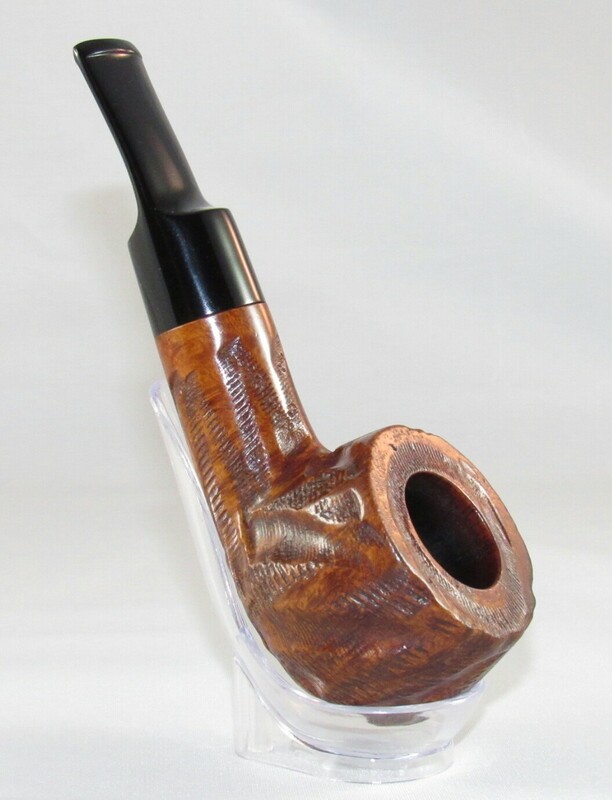 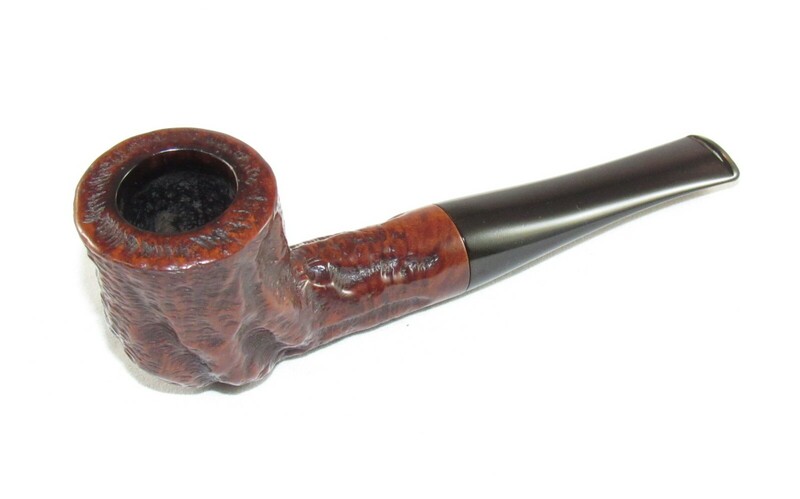 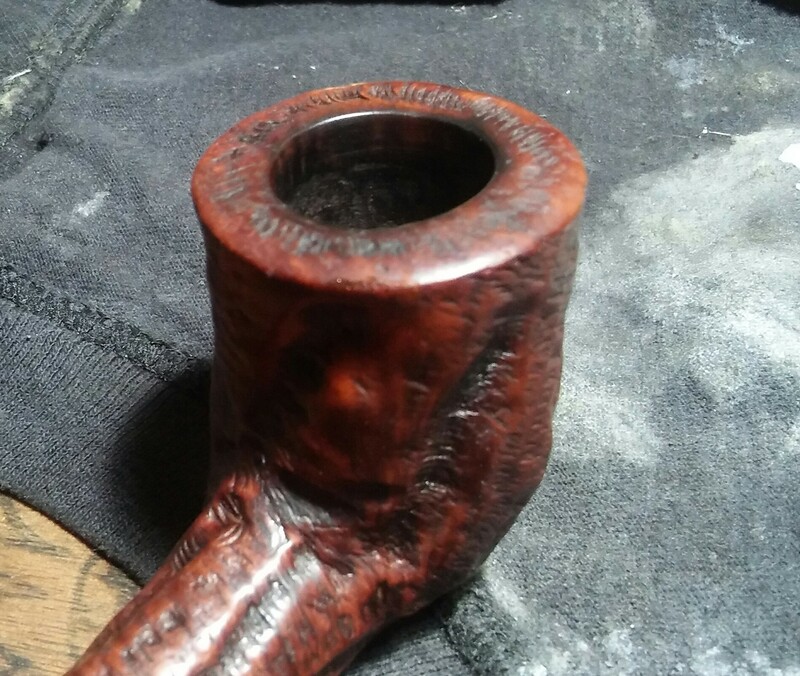 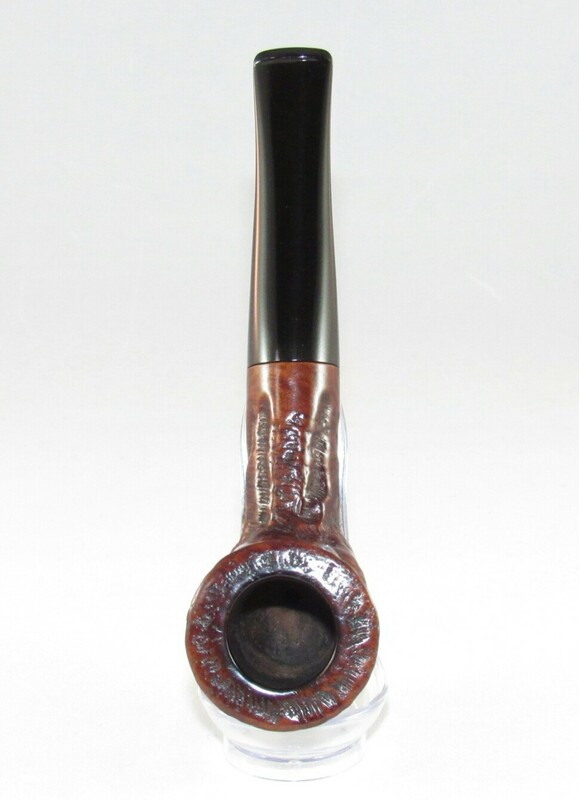 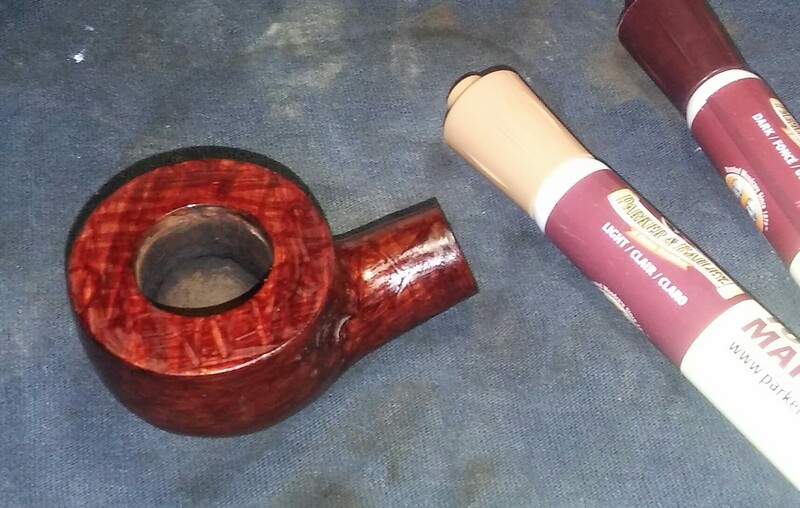 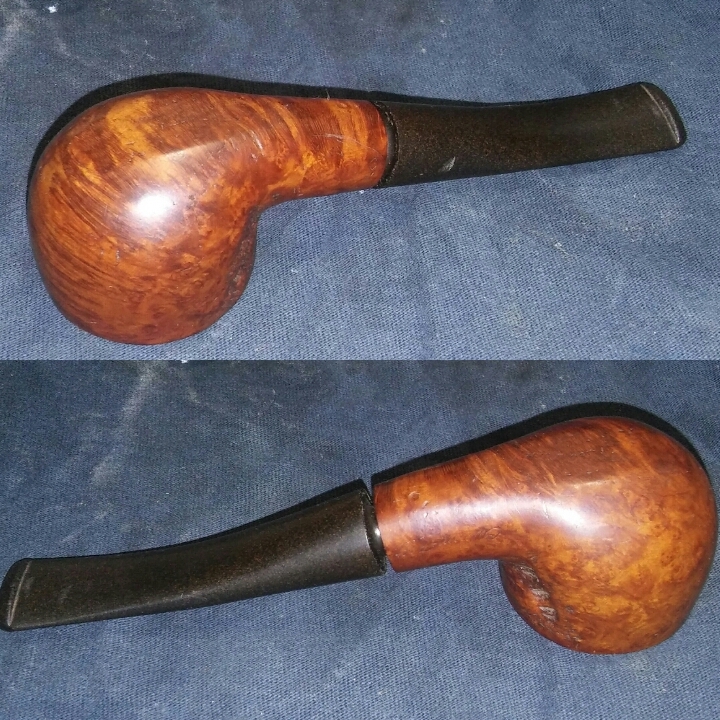 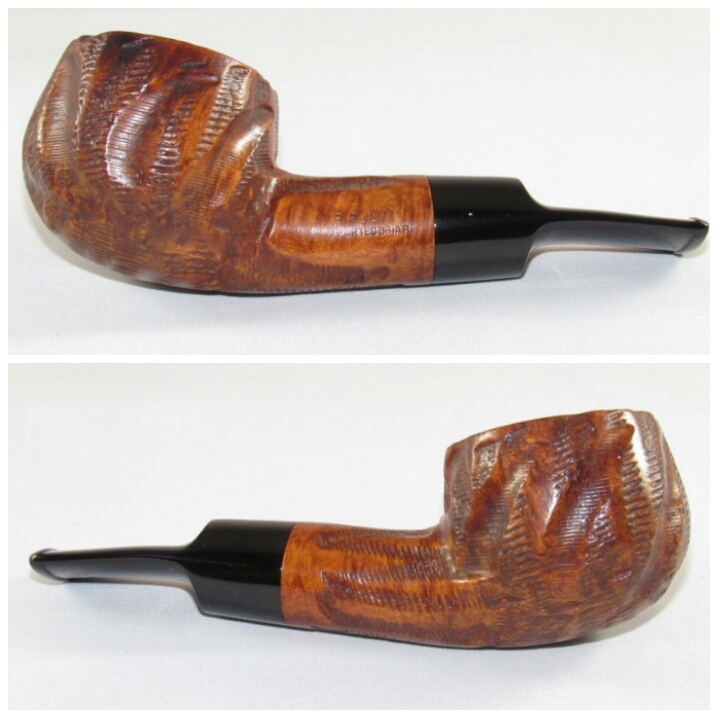 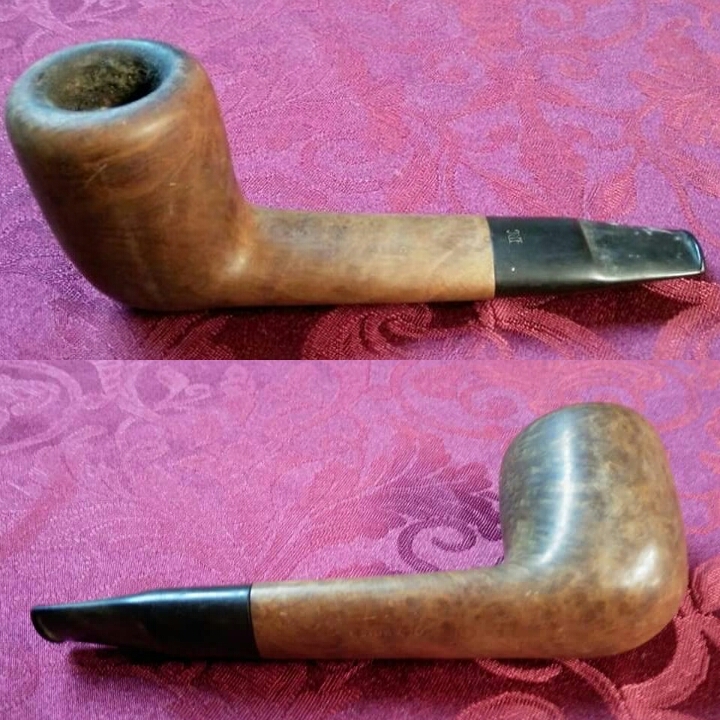 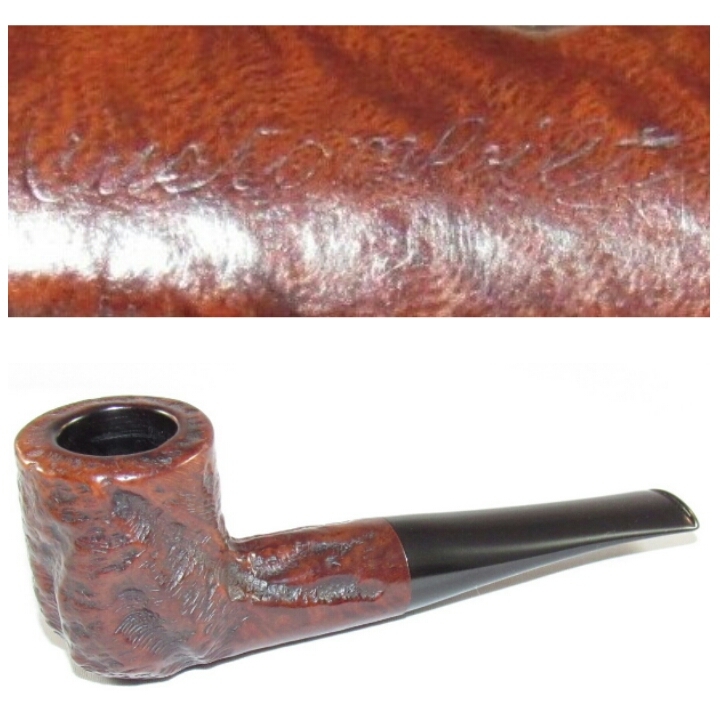 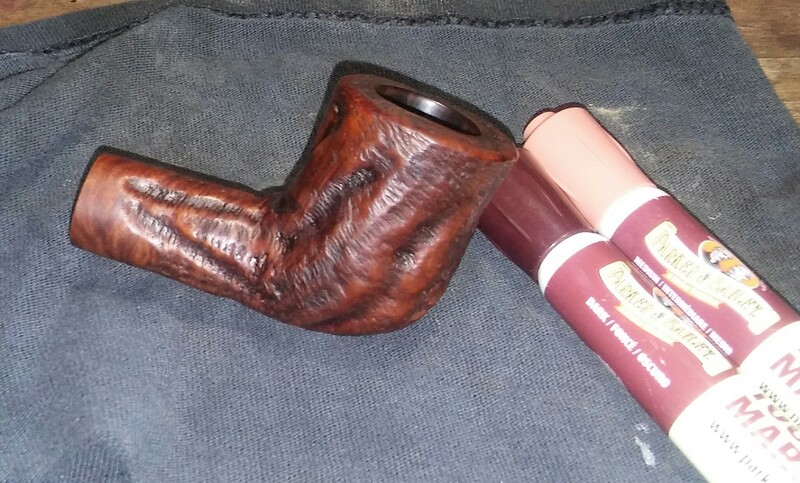 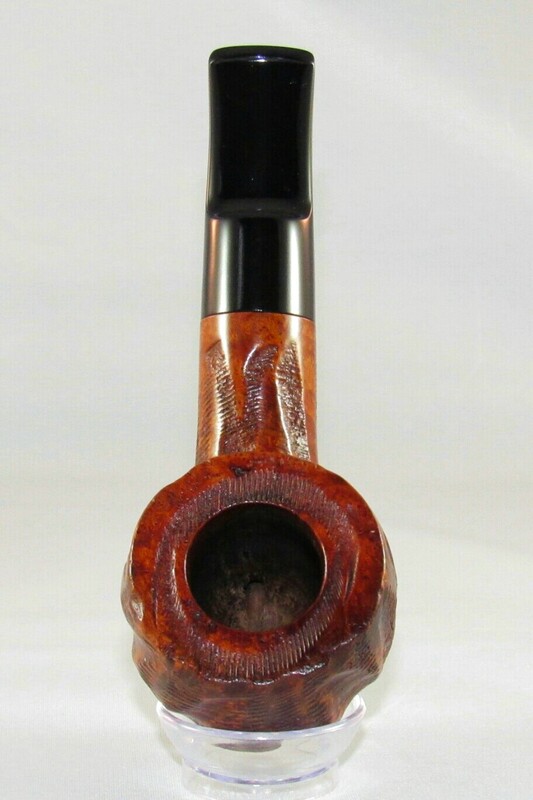 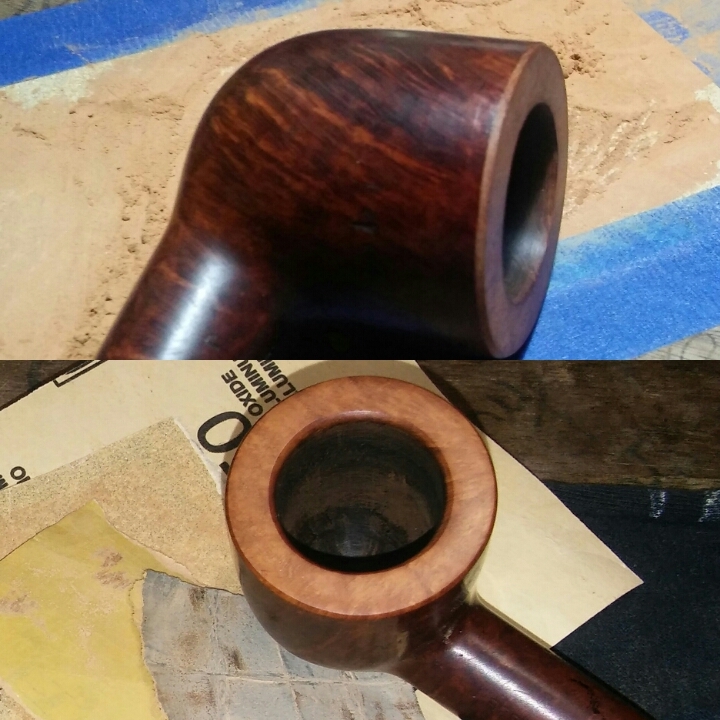 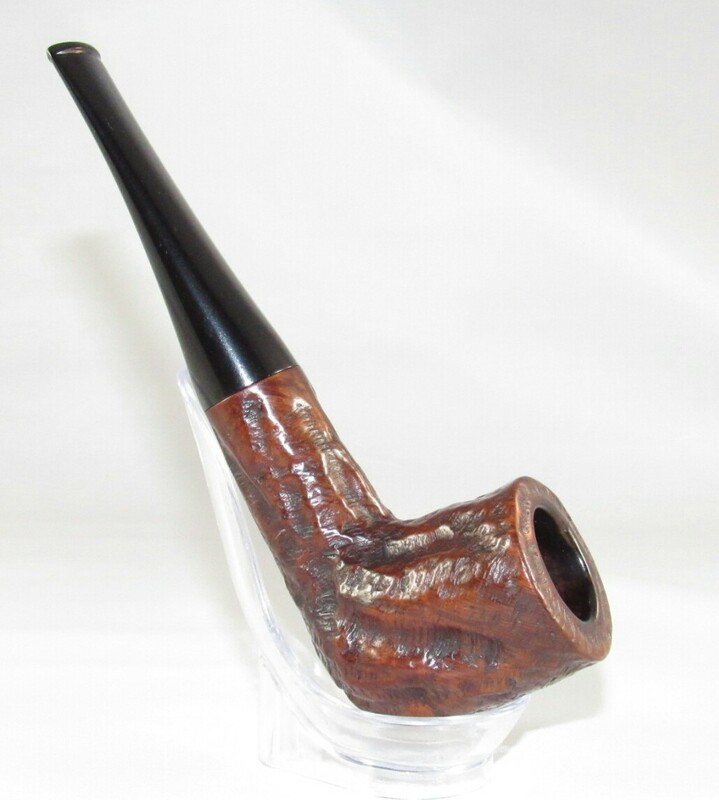 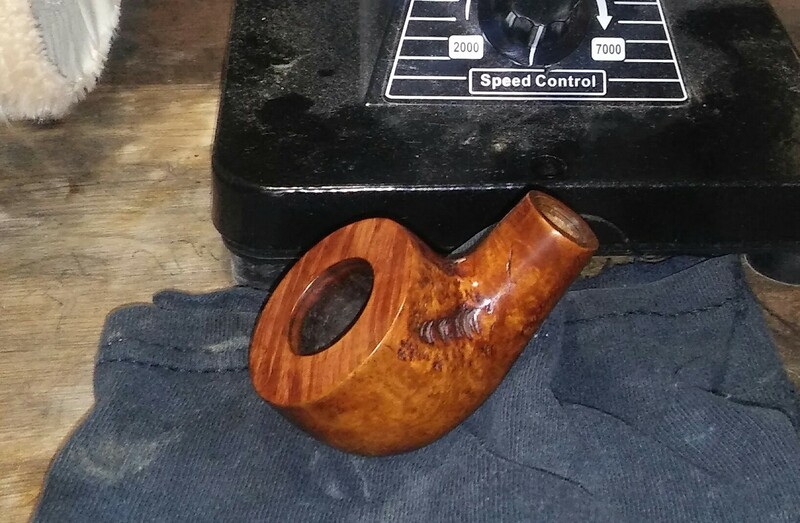 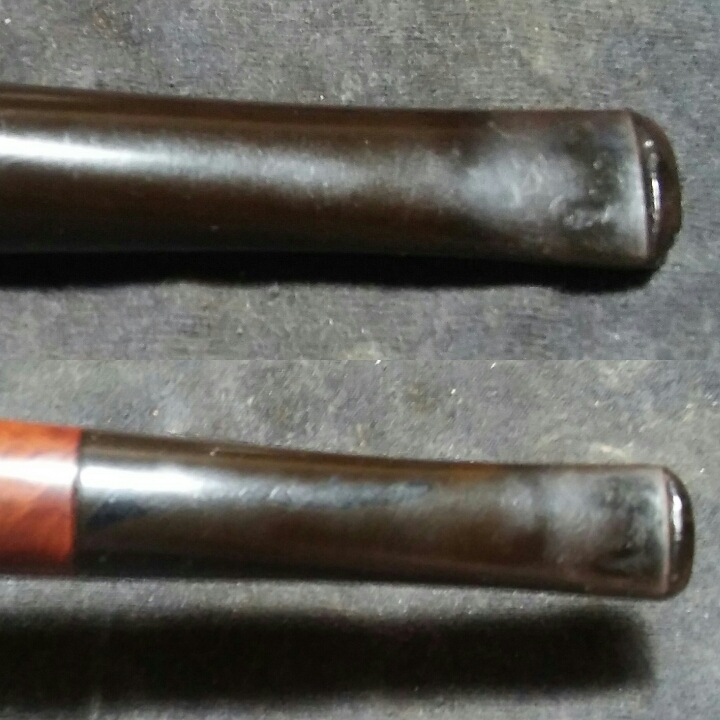 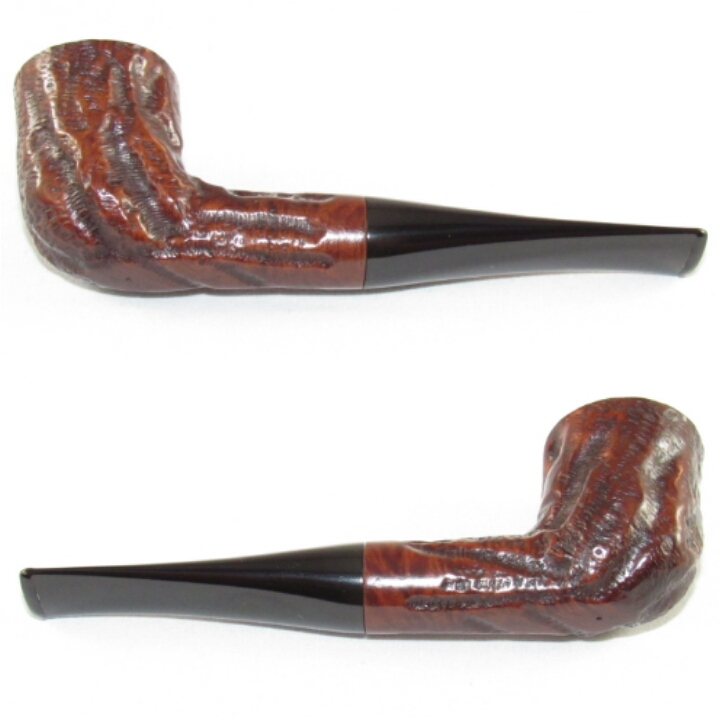 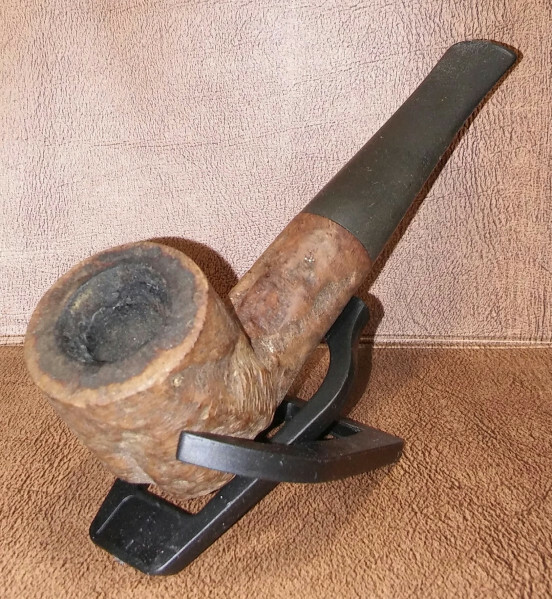 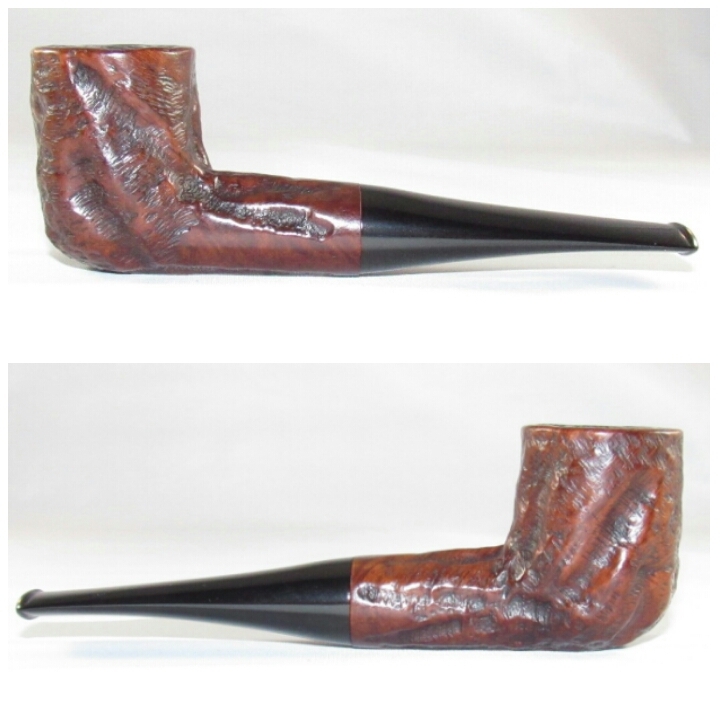 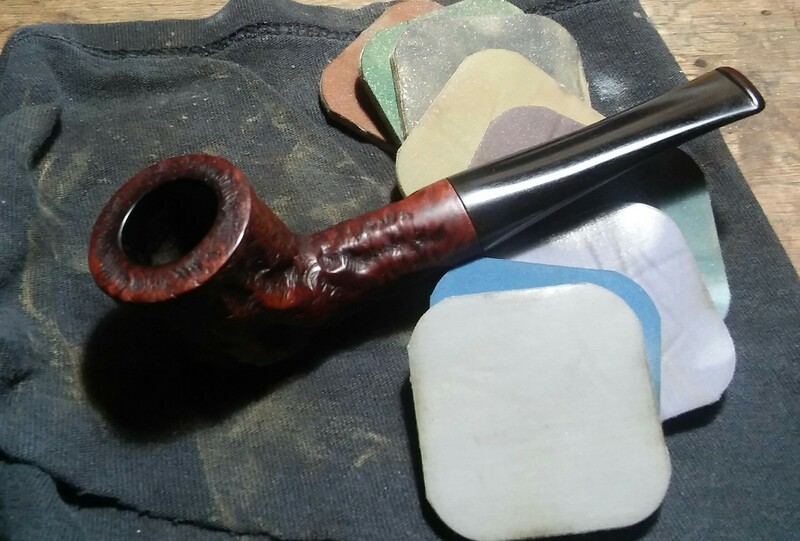 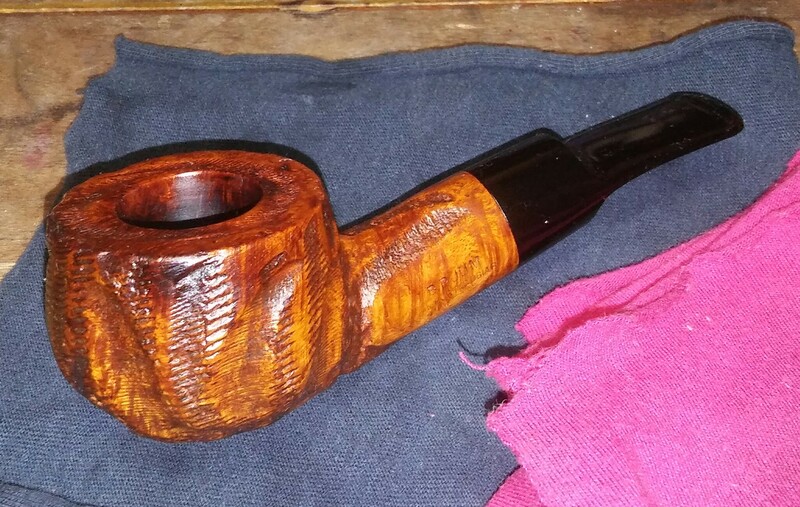 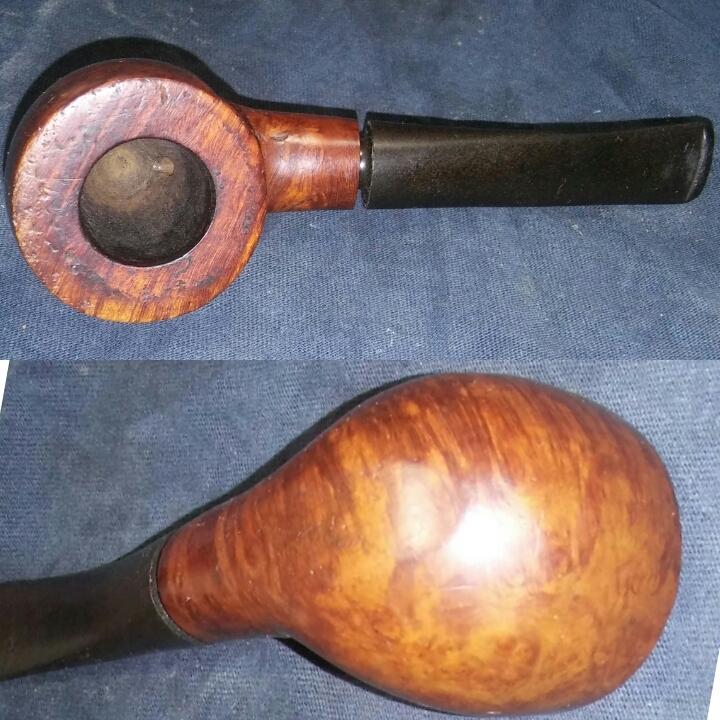 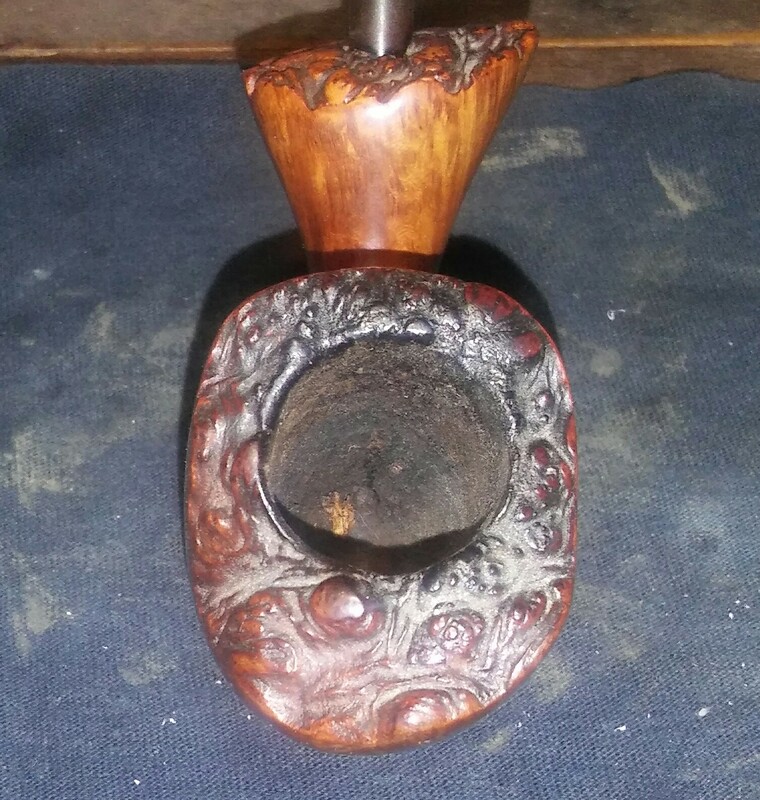 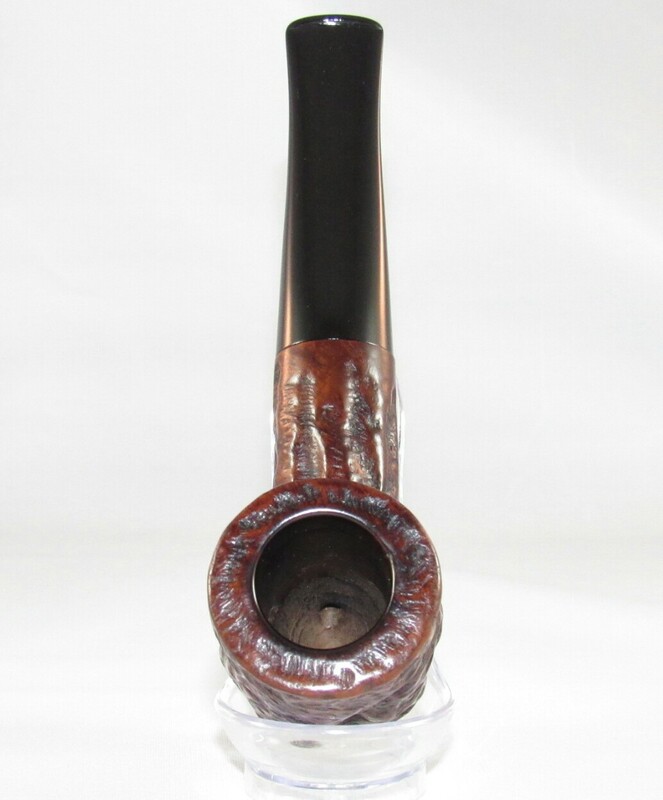 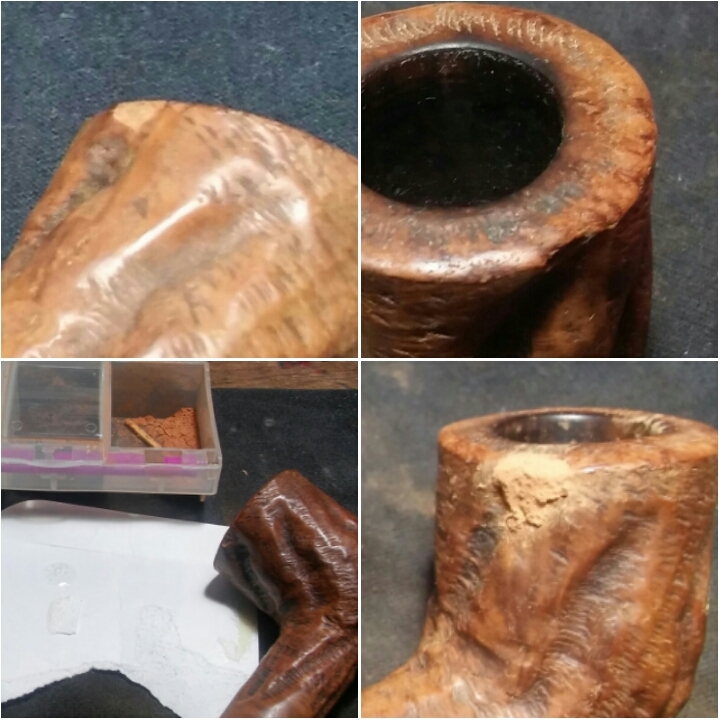 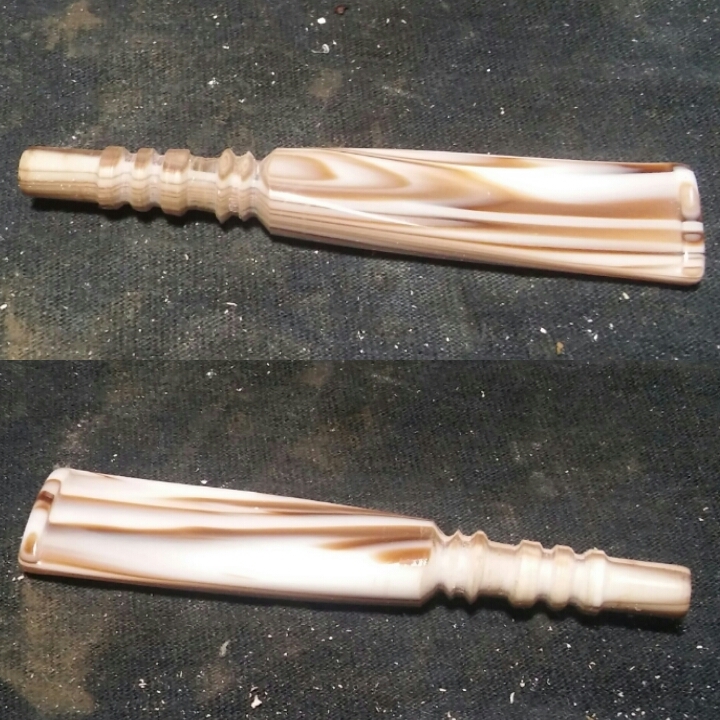 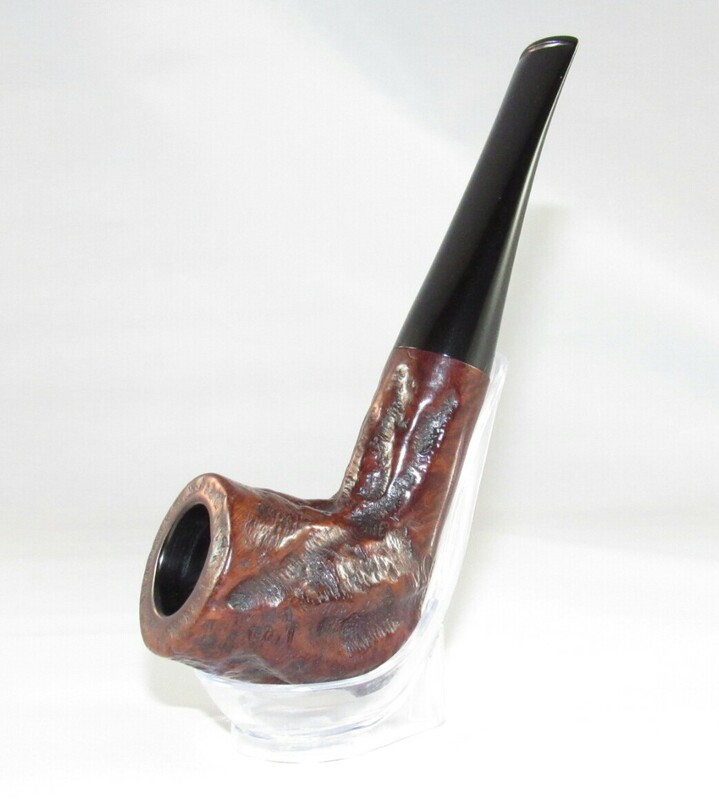 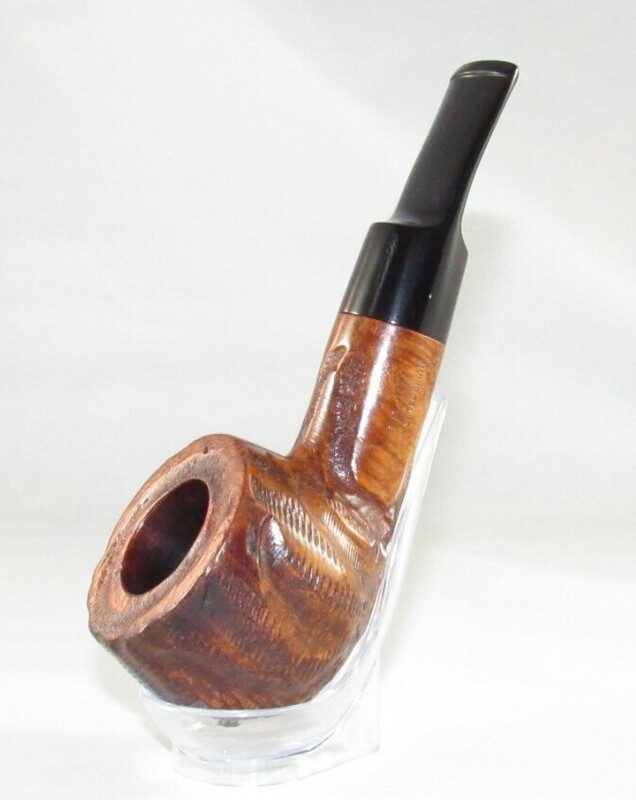 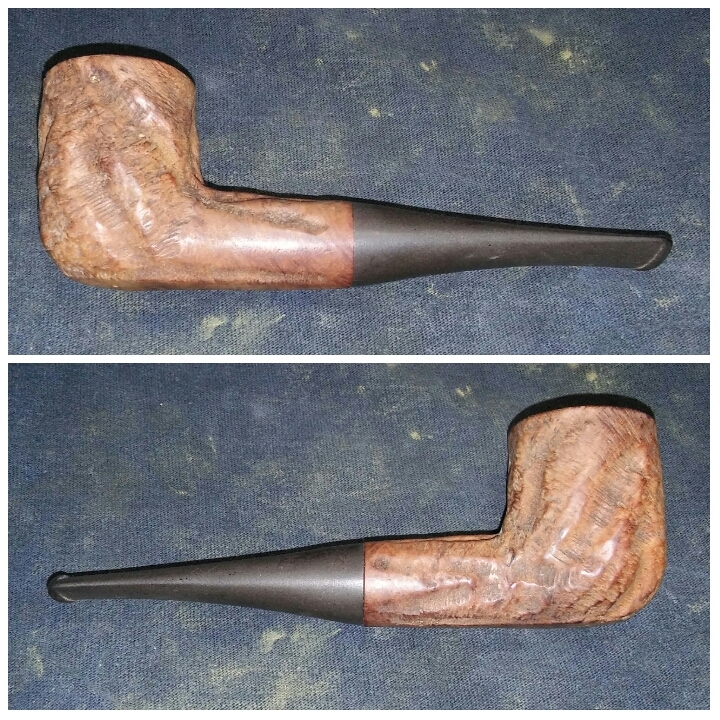 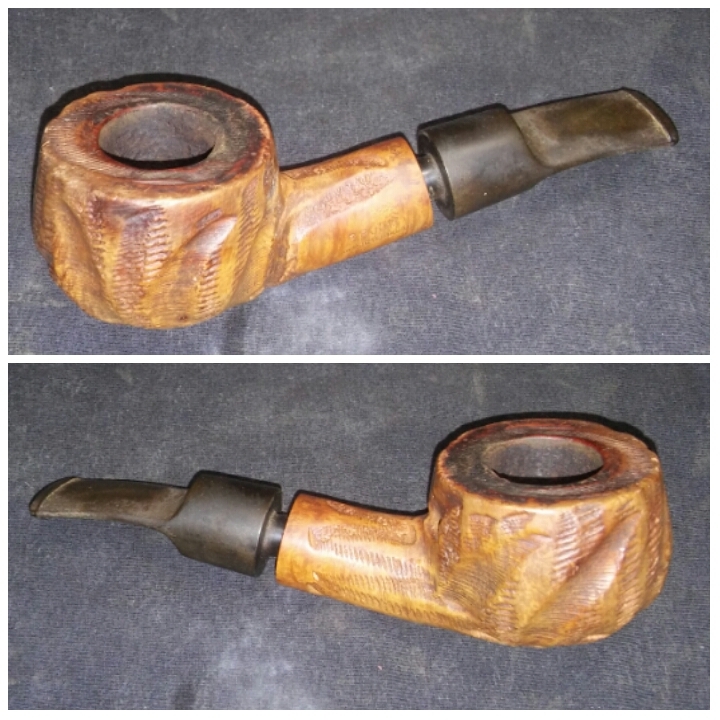 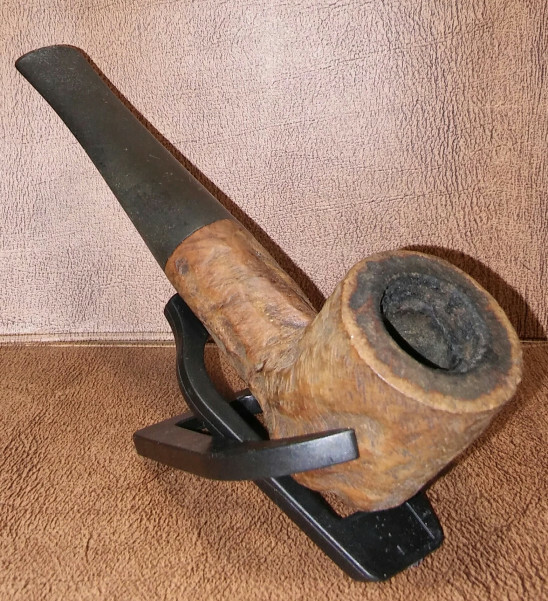 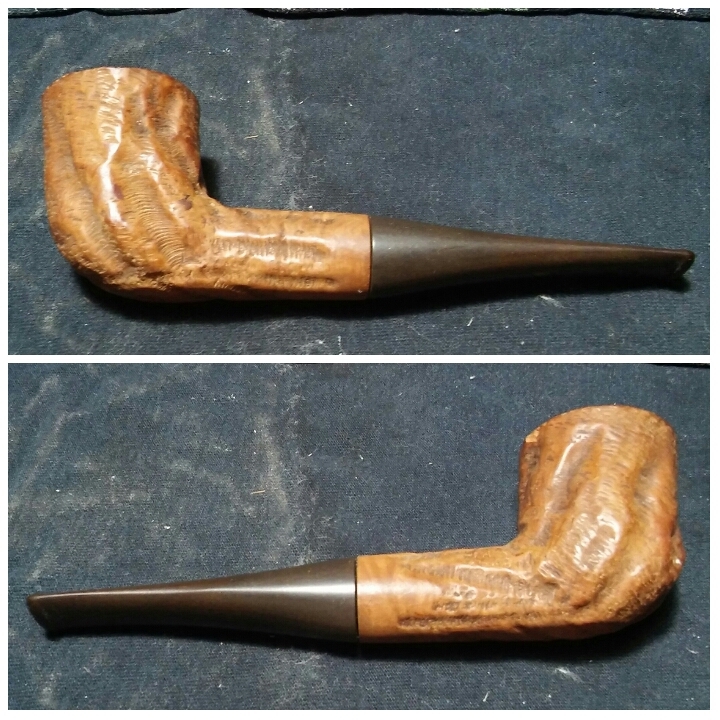 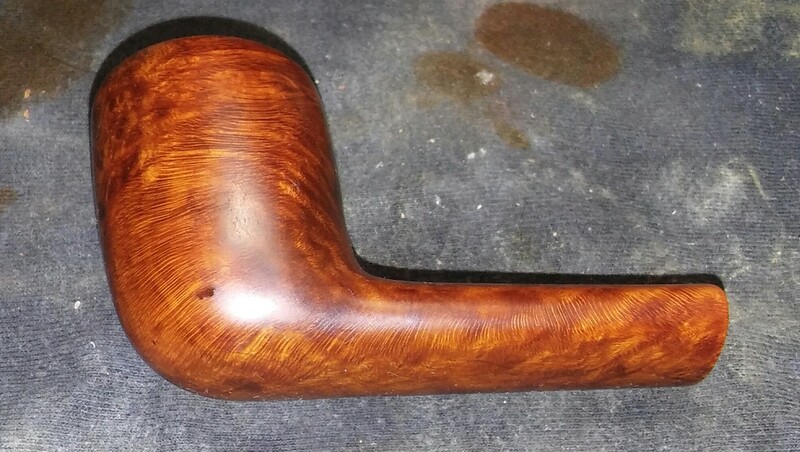 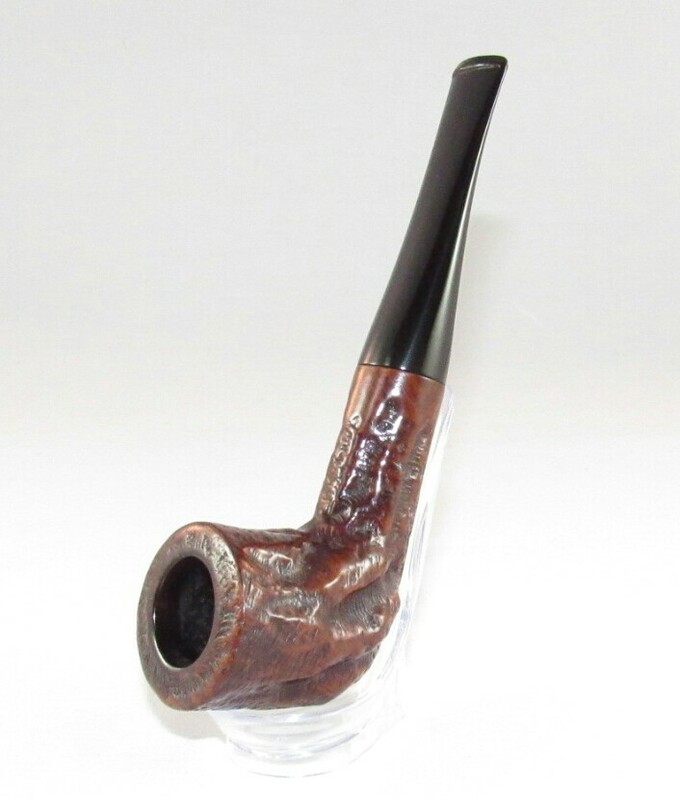 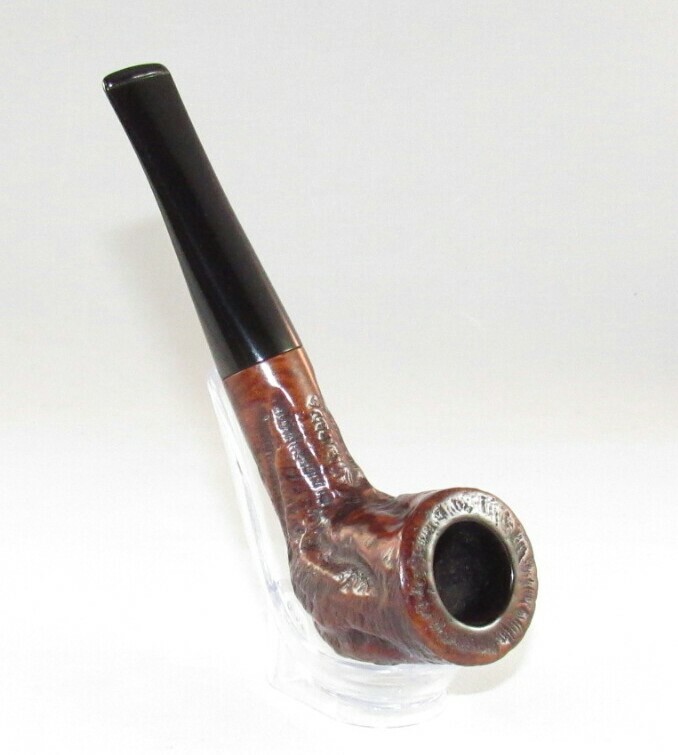 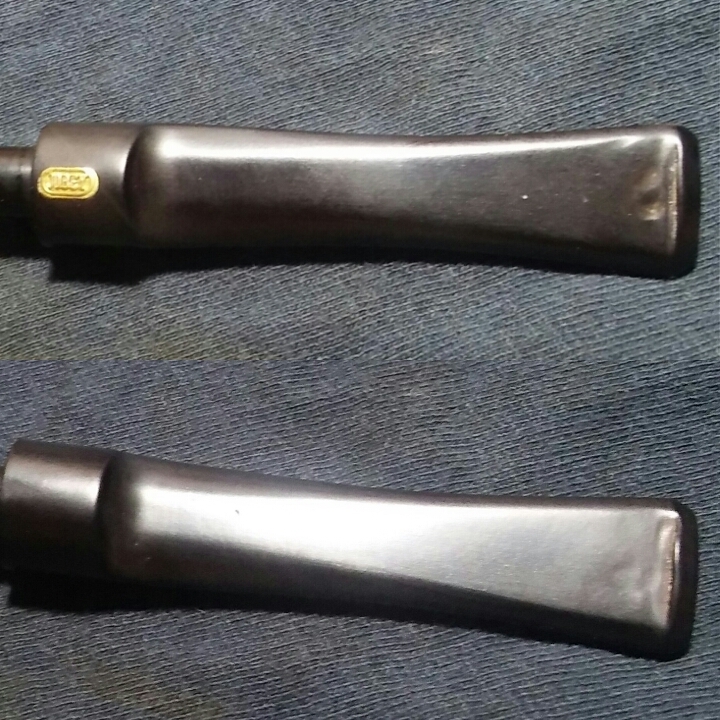 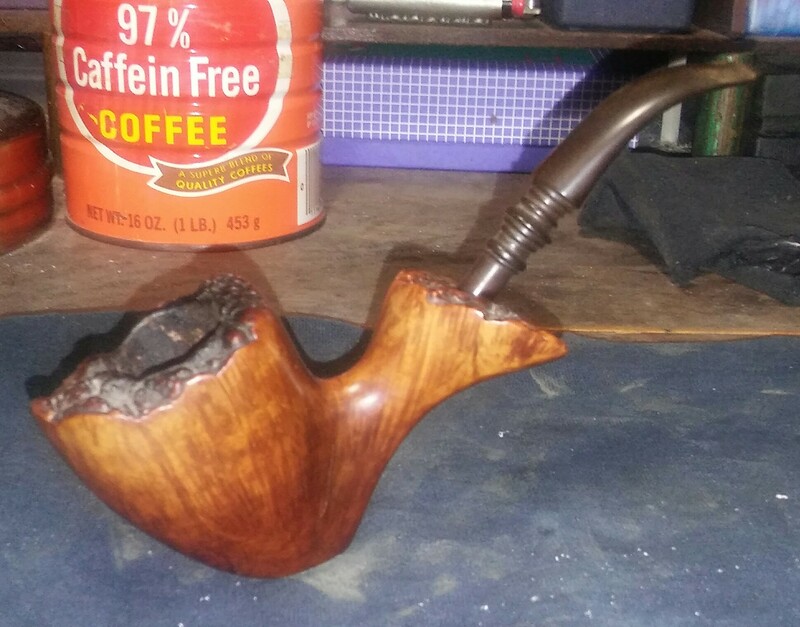 I have one un-somoked large cherrywood Ropp left. 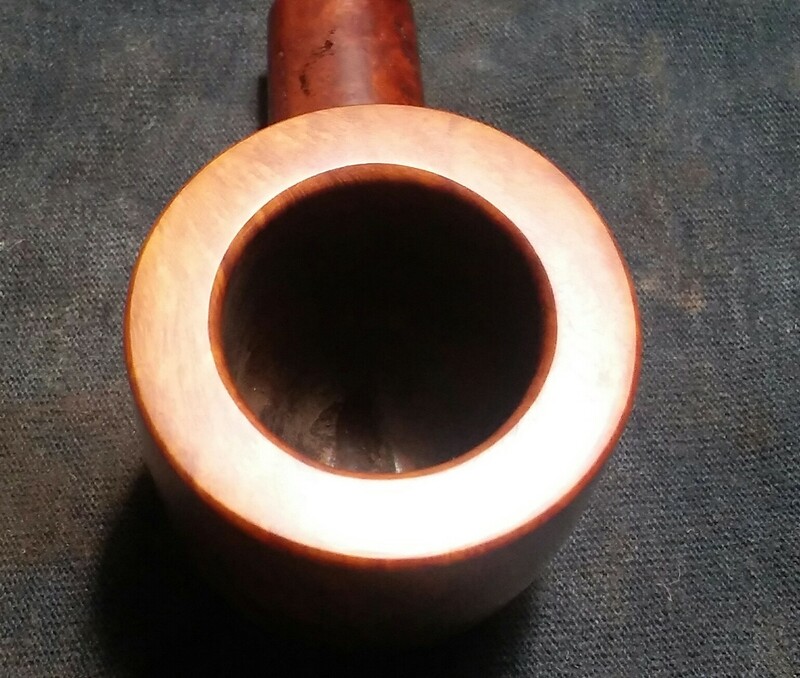 Than came Tom Howard and B P Jum pipes, this was the turning point, large and interesting, fit my face pipes. 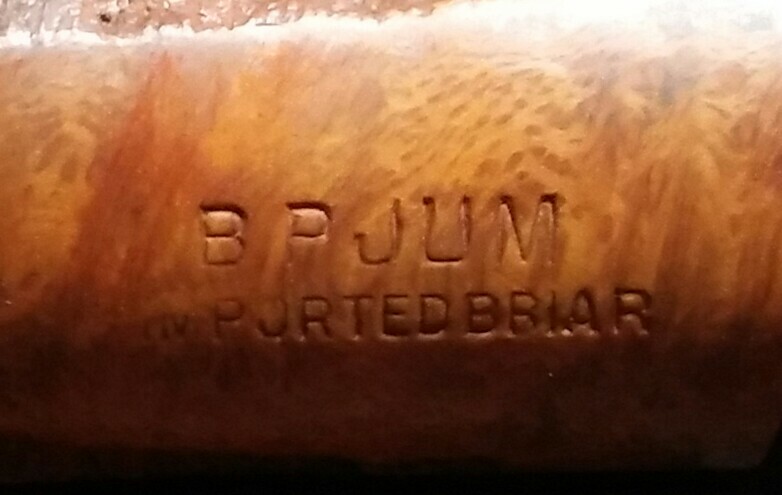 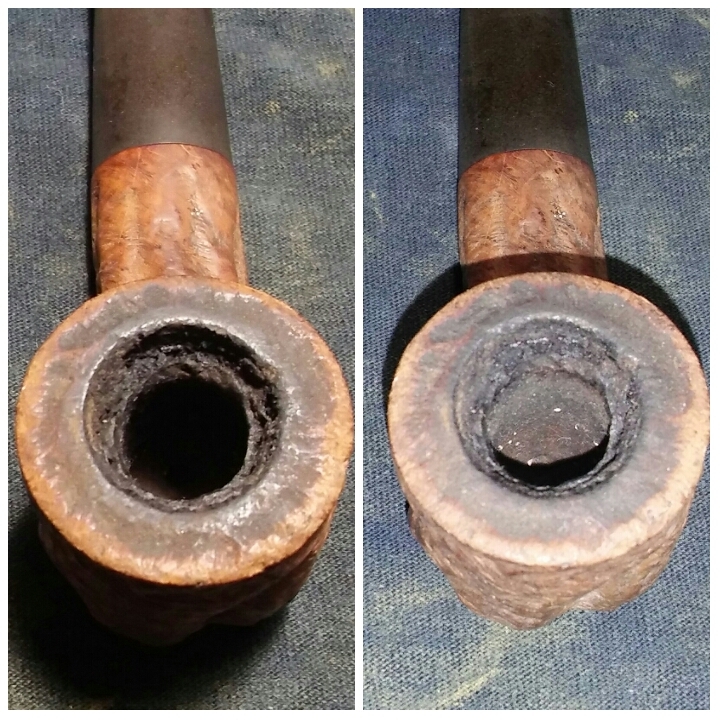 The only draw back was the overuse of filler in both Howard’s and Jum pipes, riddled like bullet holes. 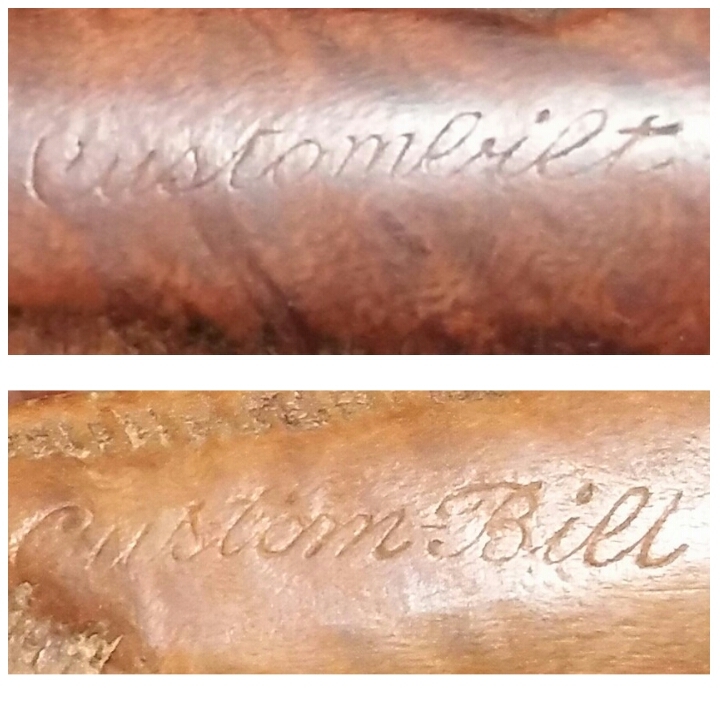 Then finely Custom-Bilt it was like being a kid again I couldn’t resist large, ugly and roughly carved. 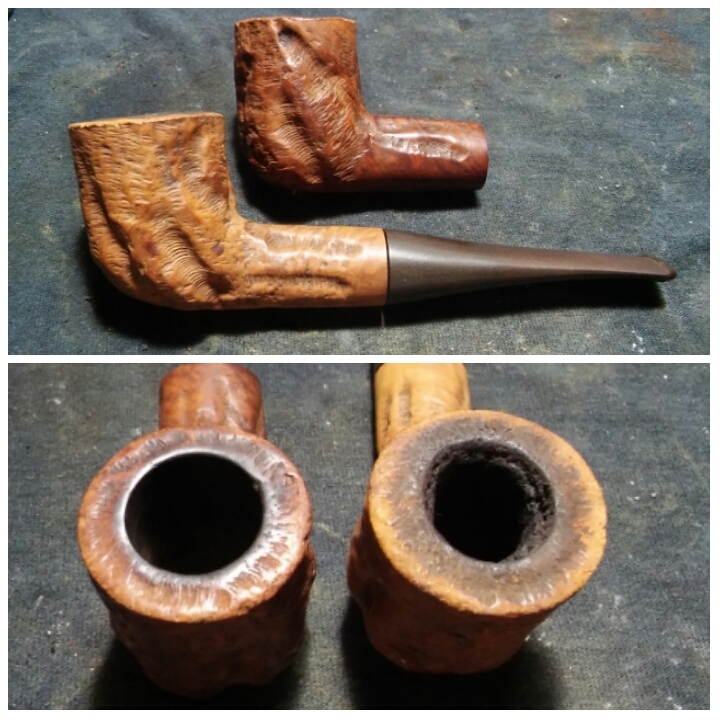 I had to get them all, each one no mater how closely they resemble one another are completely different. 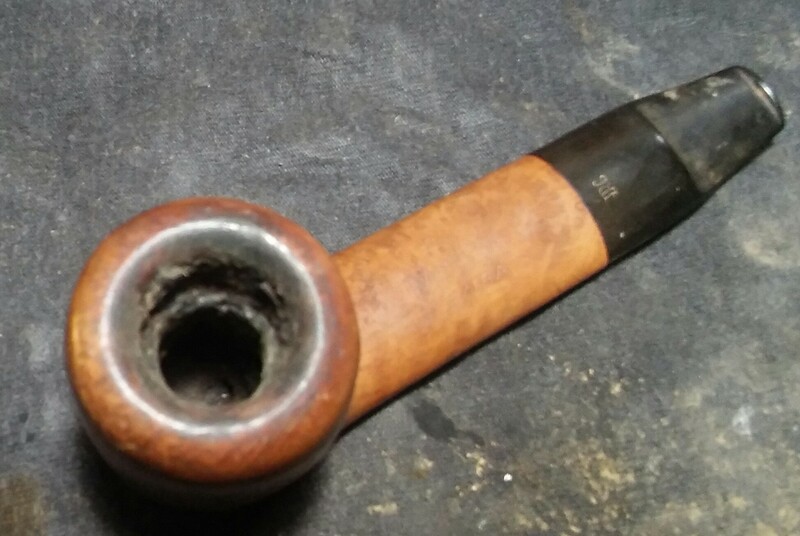 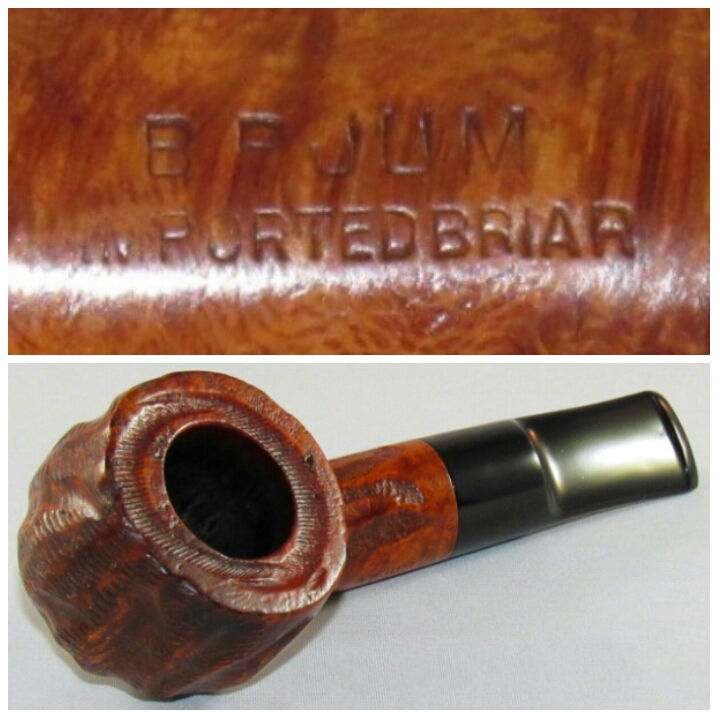 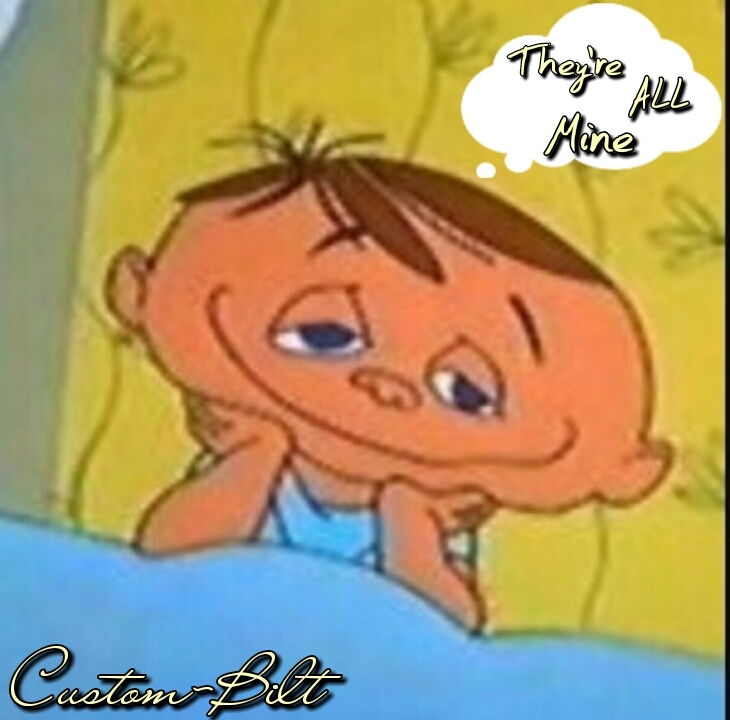 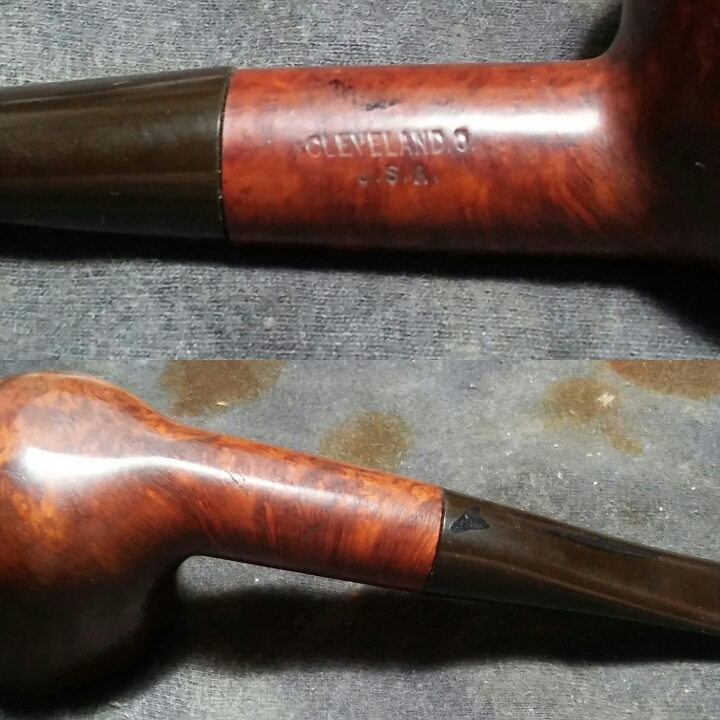 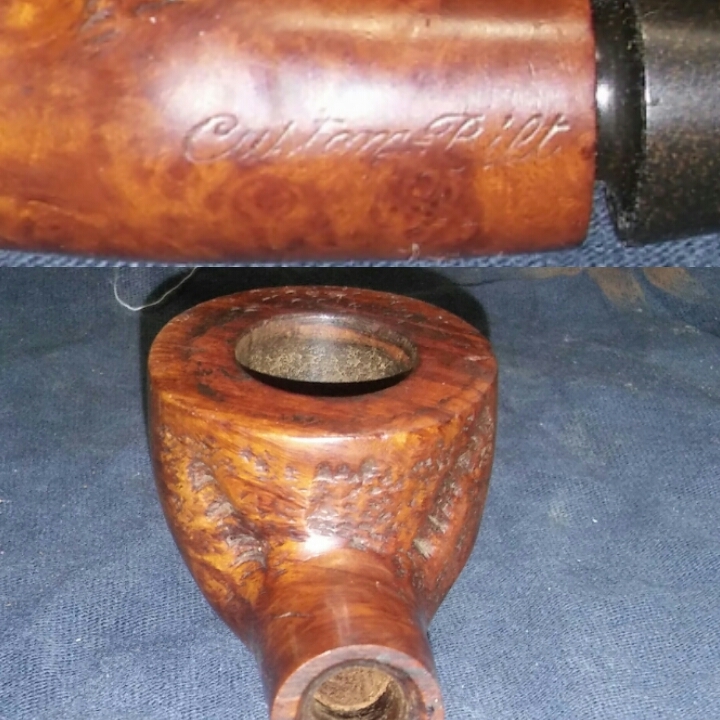 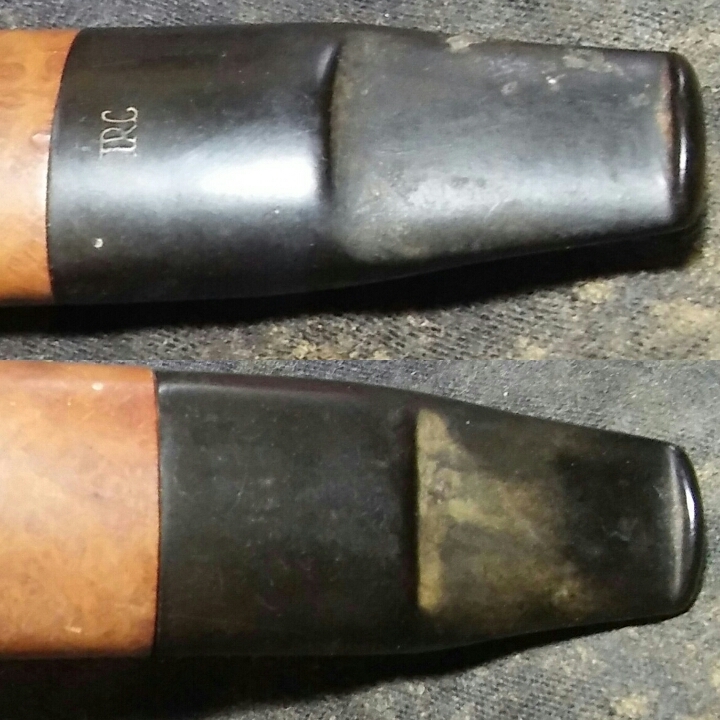 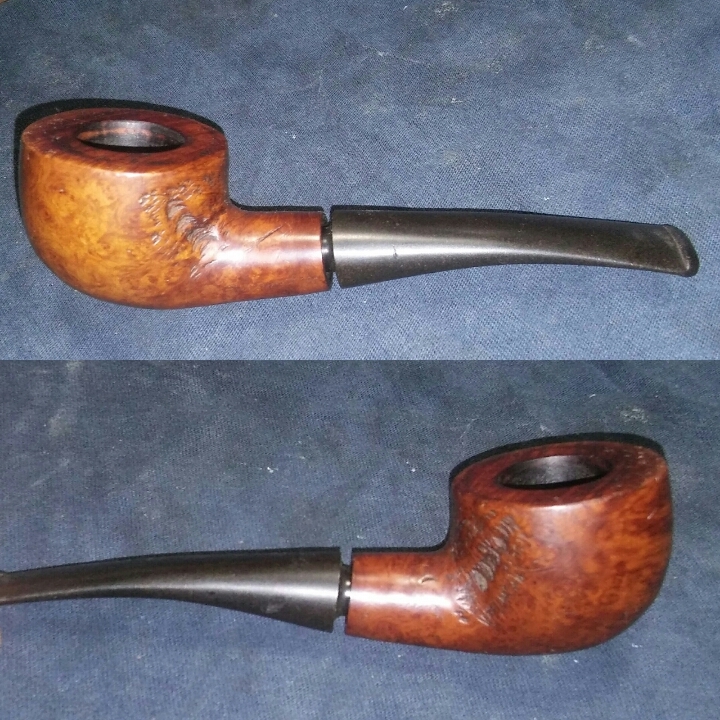 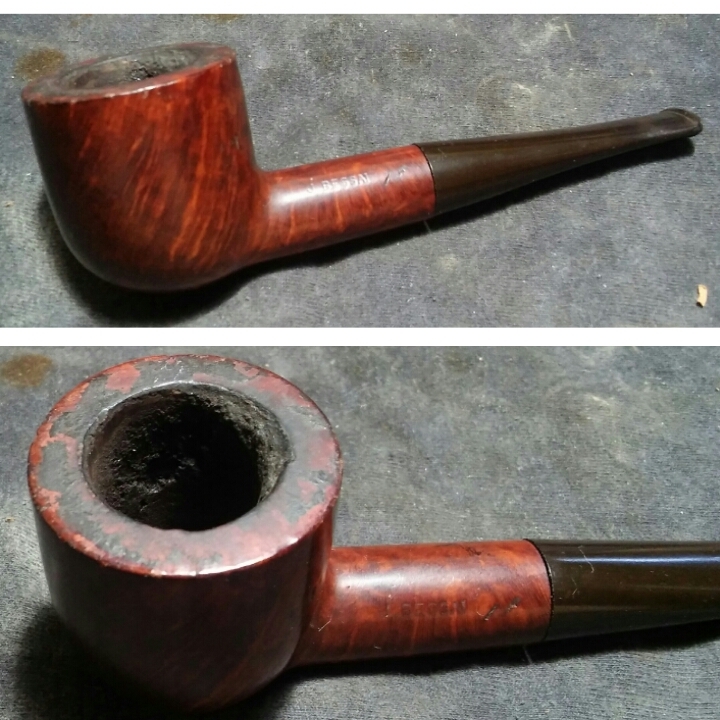 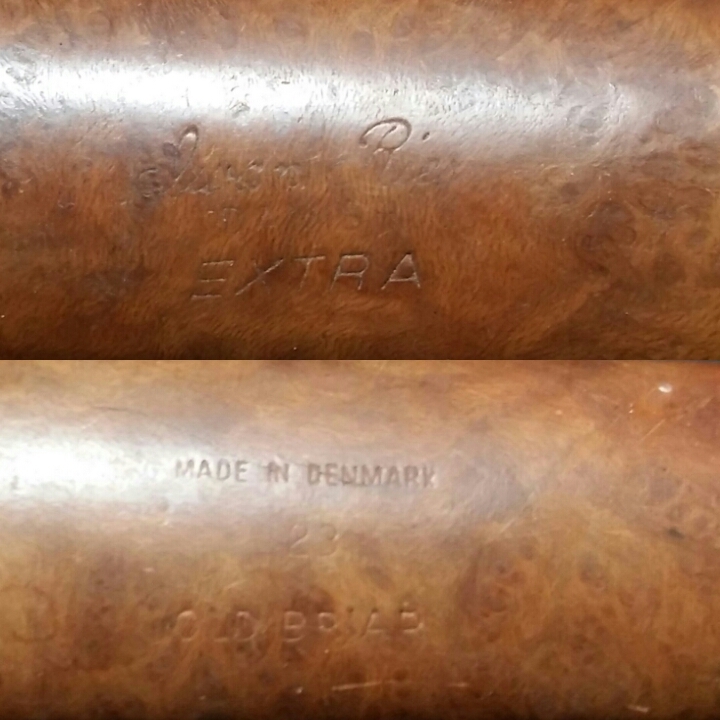 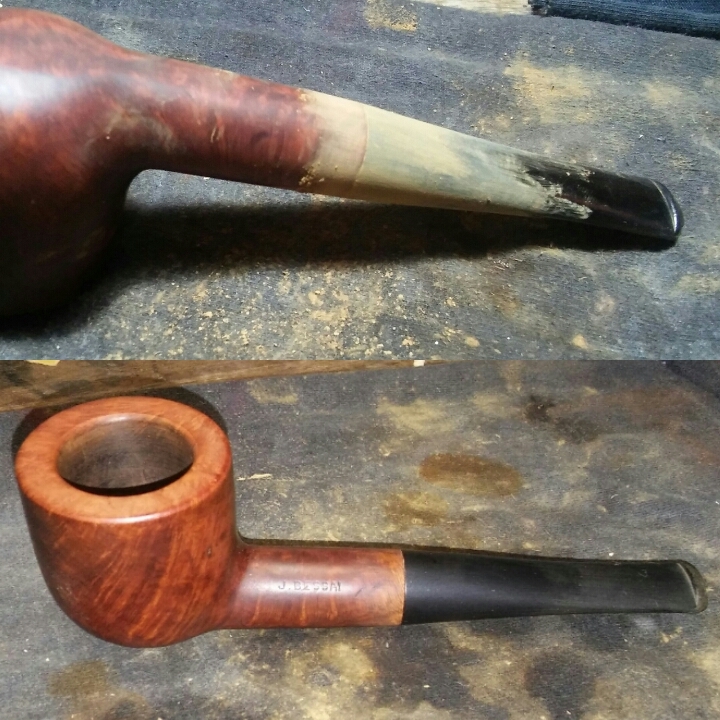 The next few refurbs will be Custombilt pipes as I have many waiting in line to be revived. 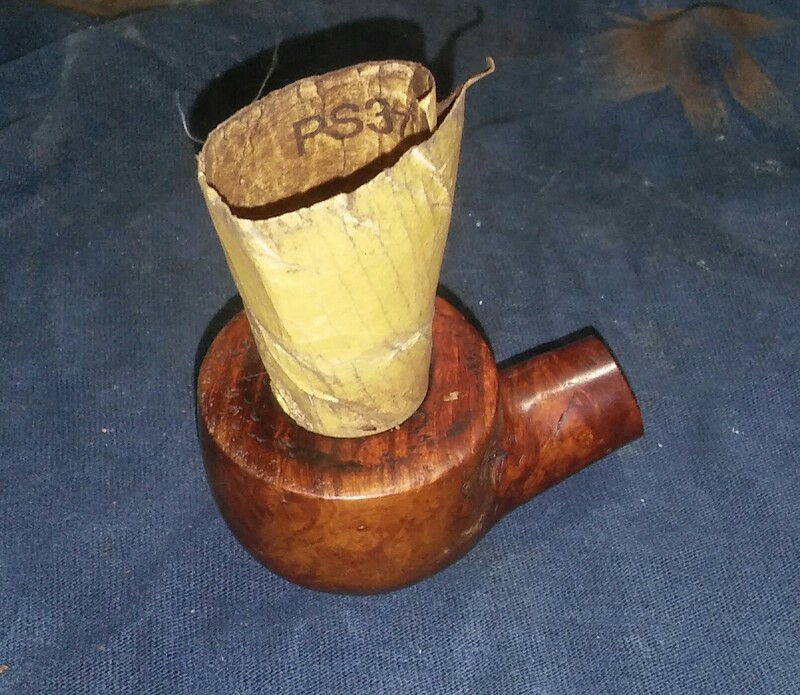 I need to take photos of my complete collection, I’m not really sure how many I have at this point. 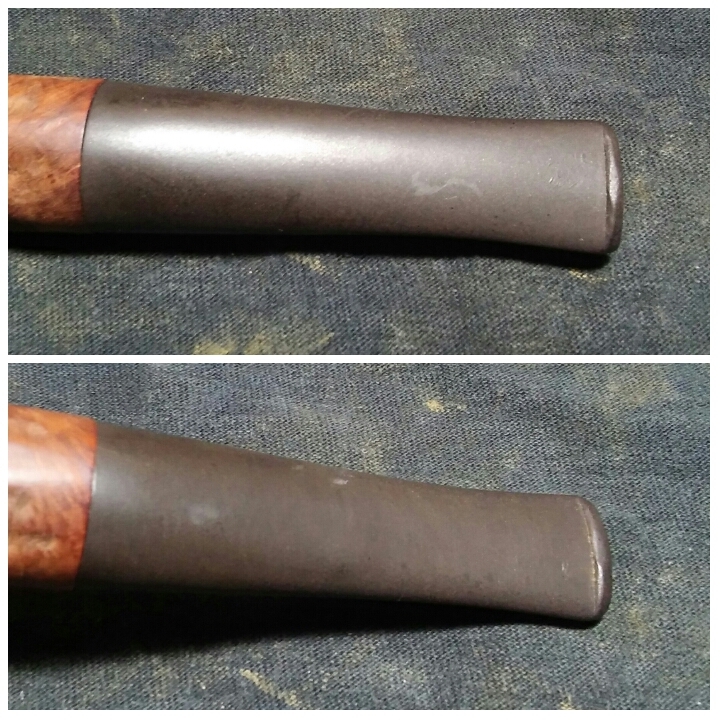 Overall she was in good condition, uneven cake, a chip out of the side of the bowl, stem oxidation and faded finish. 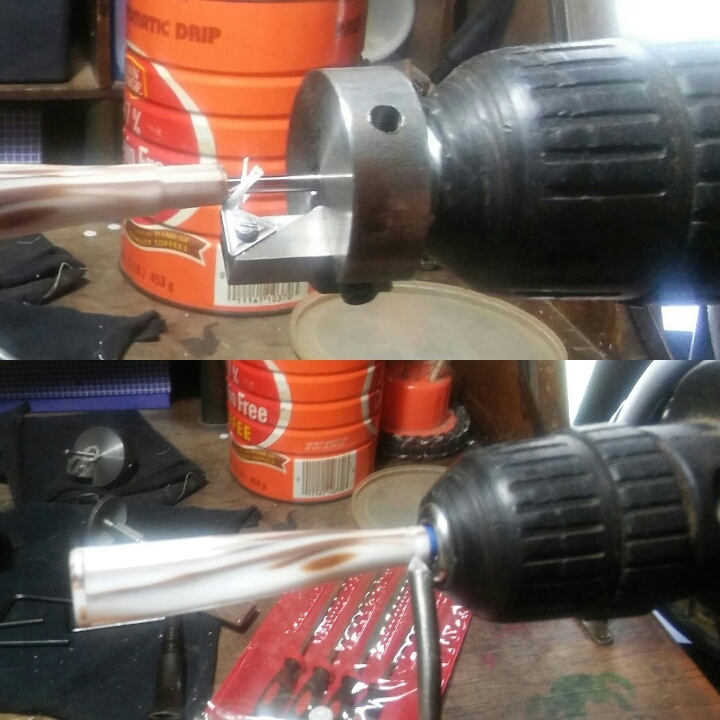 I started with my Pipnet Reamer and the smallest attachment and working up to the second largest. 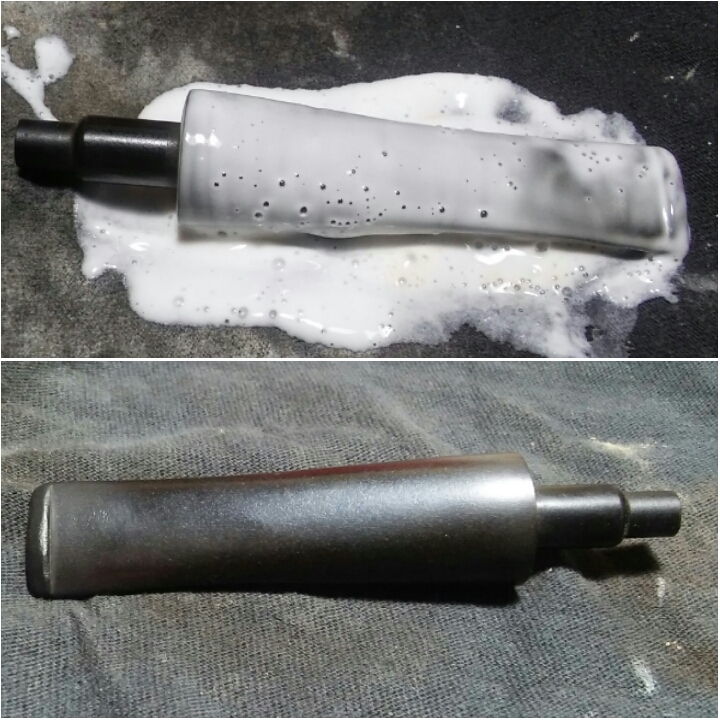 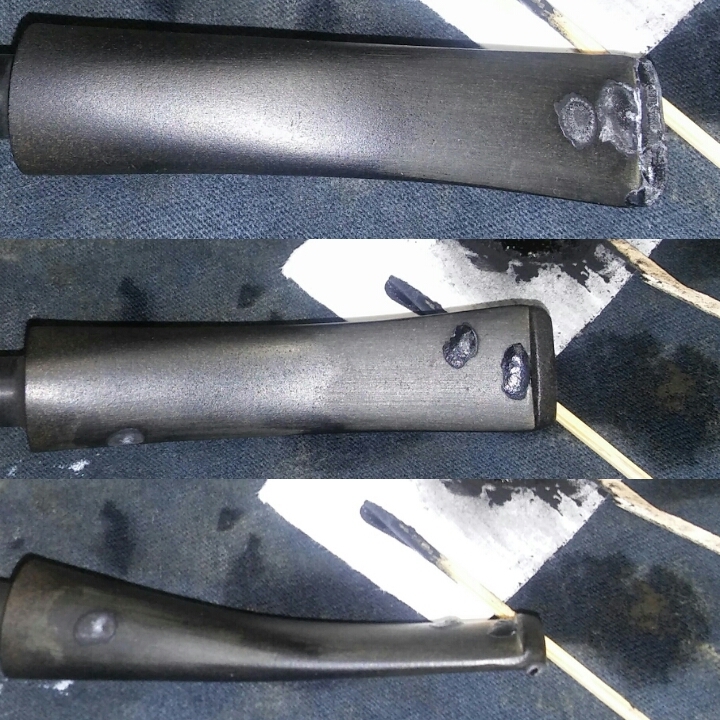 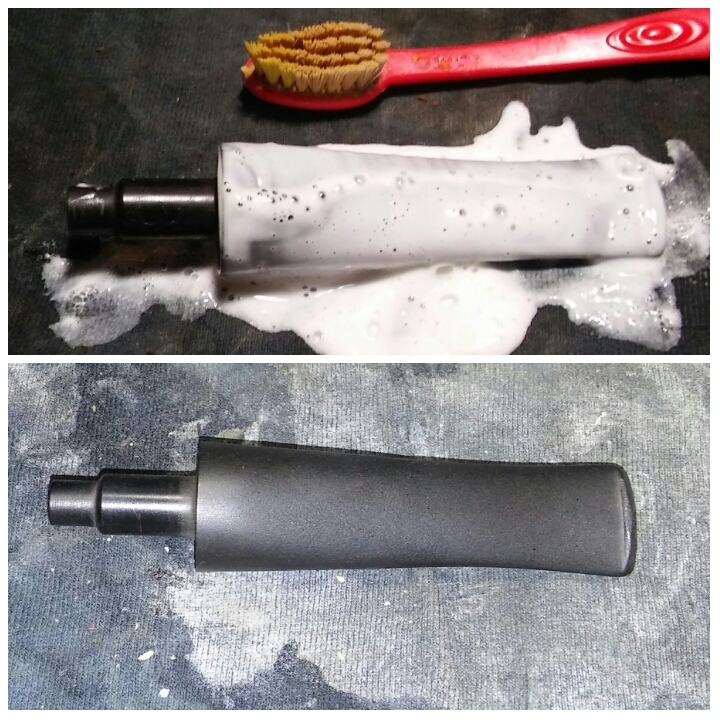 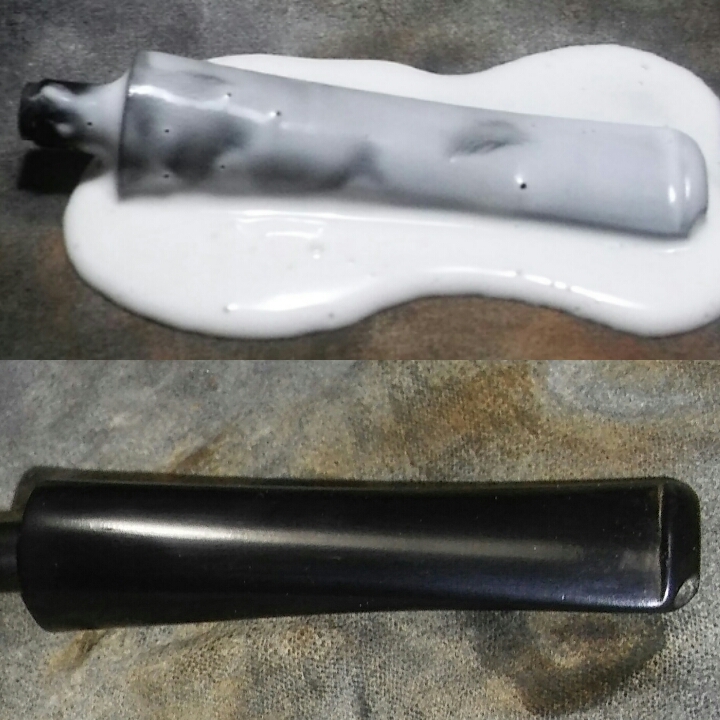 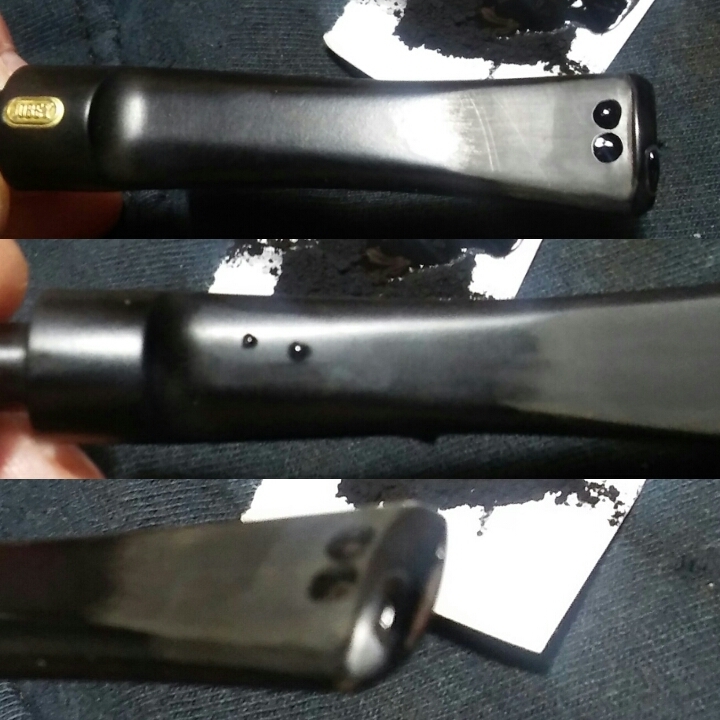 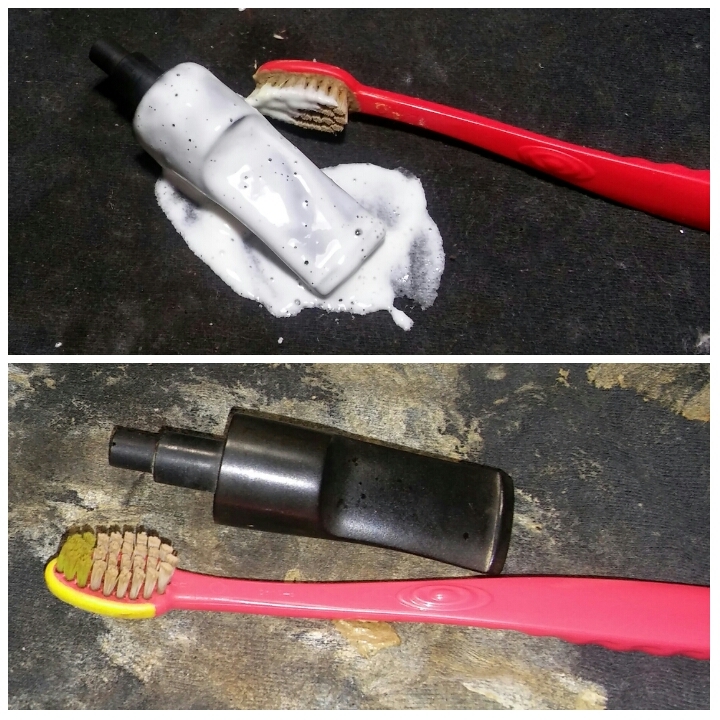 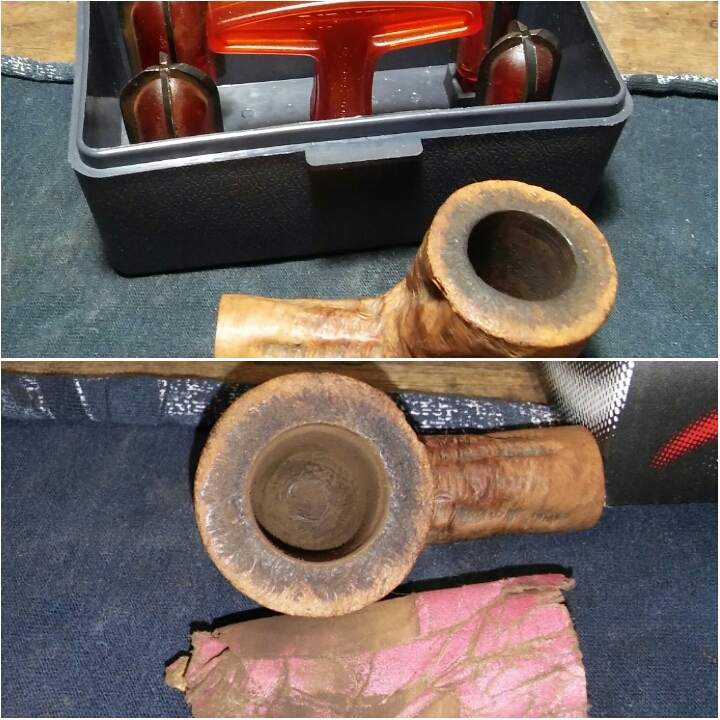 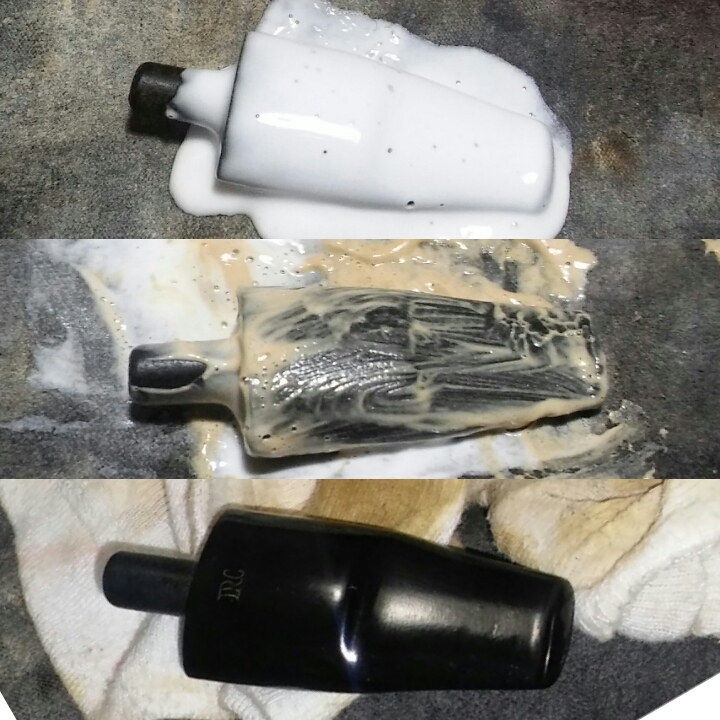 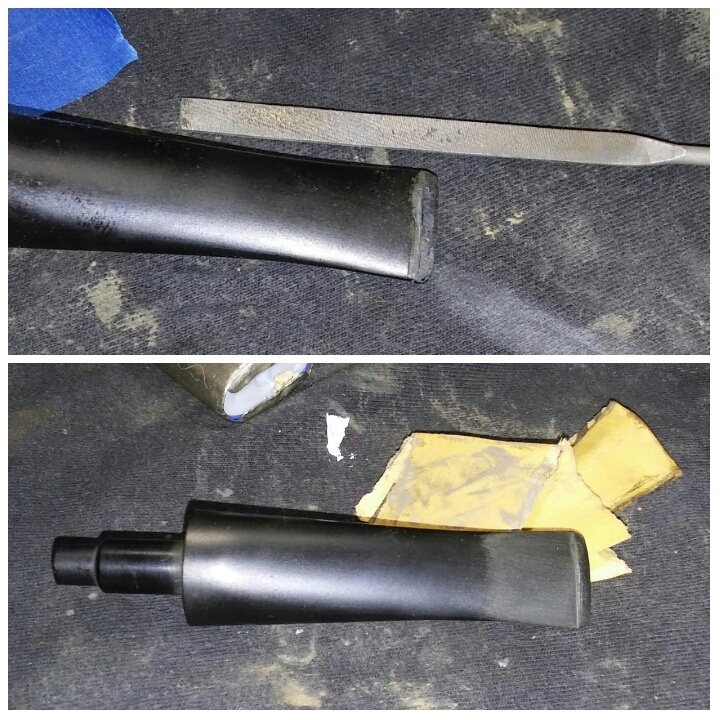 The chamber was free of burn out or pitting, I smoothed things out with 400 grit sandpaper wrapped around a finger. 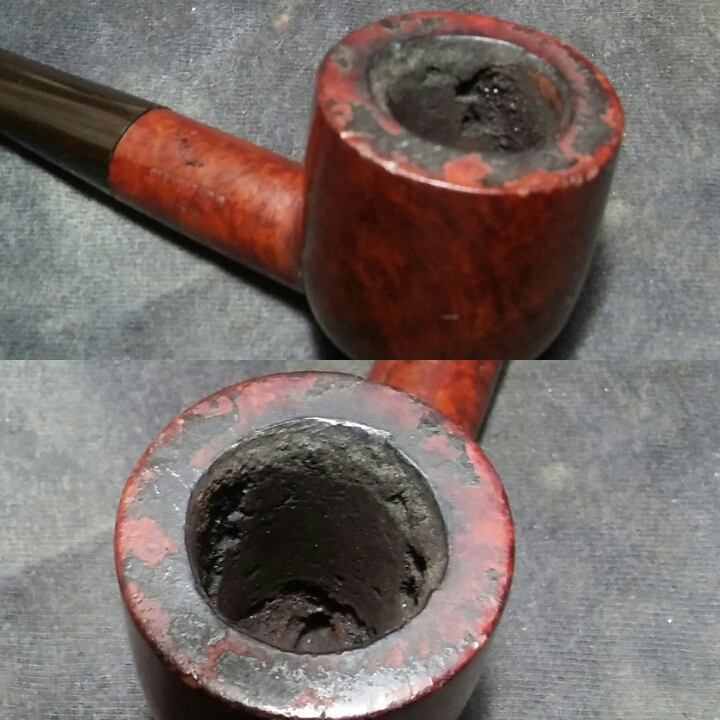 With the chamber reamed I moved to the rim build up, the rim was built up with tars and char. 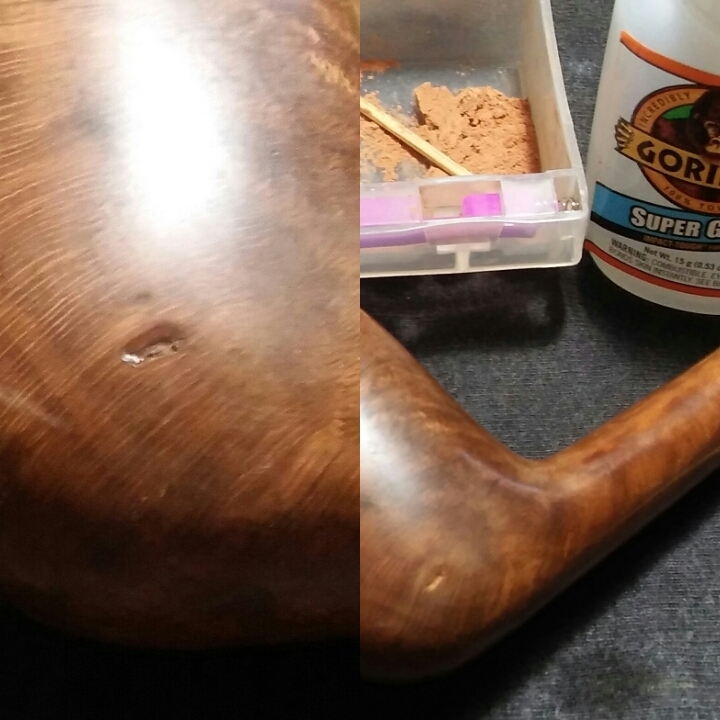 I applied a generous amount of Method Good For Wood Polish to the rim and set aside to penetrate the build-up for a few minutes. 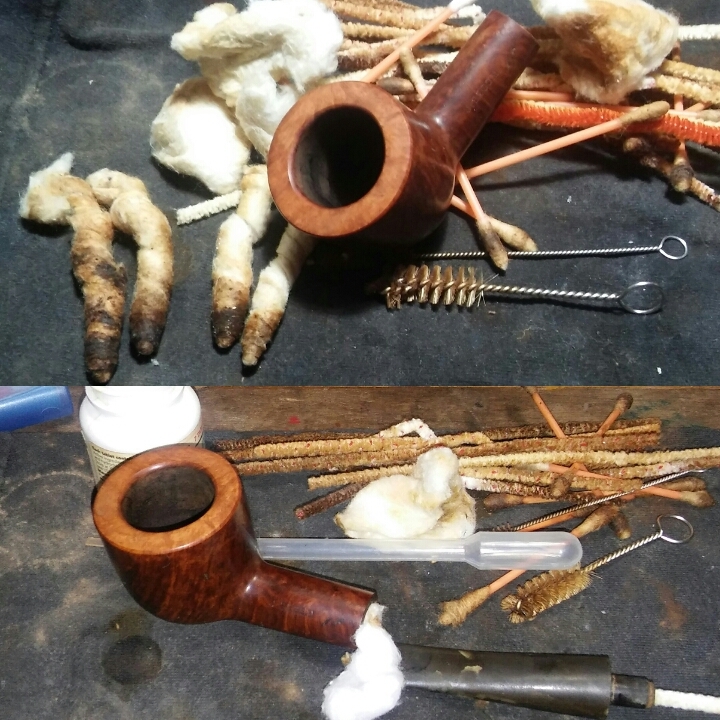 Using Q-tips I removed the build-up, I would repeat this process a few times. 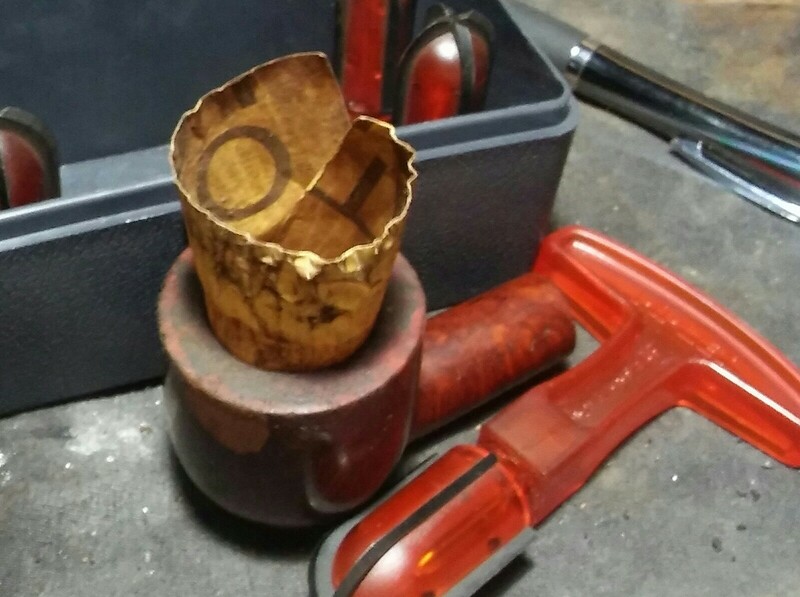 The chip in the side of the bowl would be repaired with Gorilla Glue and briar dust. 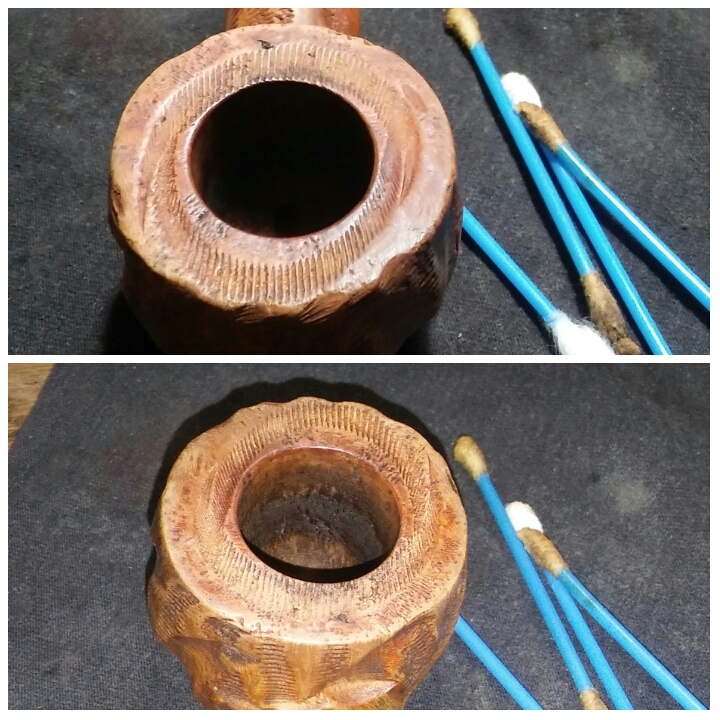 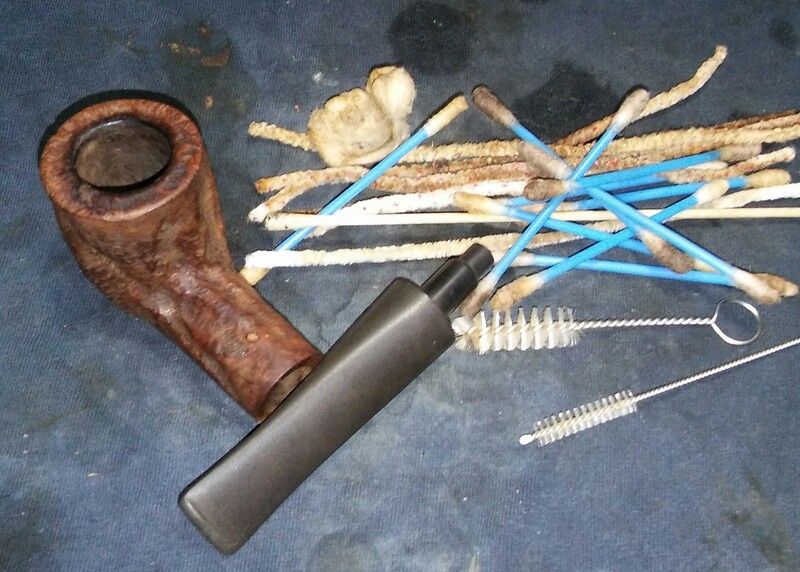 I cleaned the area of repair with EverClear, Q-tips and let dry. 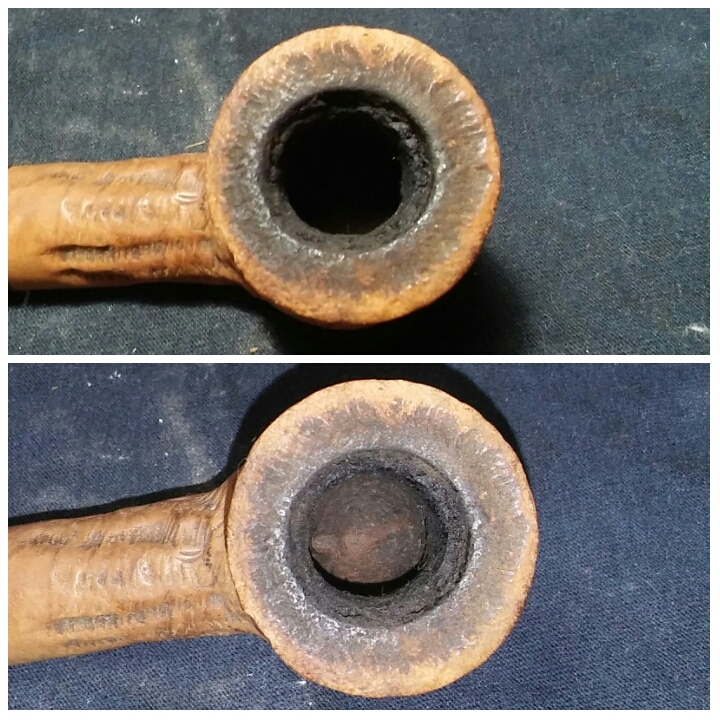 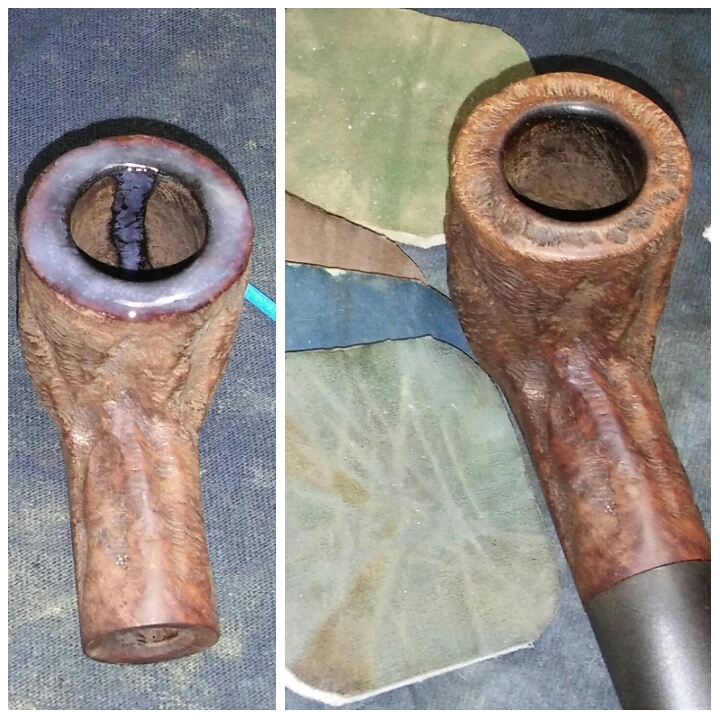 I filled the crack with Gorilla Glue and briar dust and allowed it to dry, I removed the excess glue and dust with worn micro-mesh. 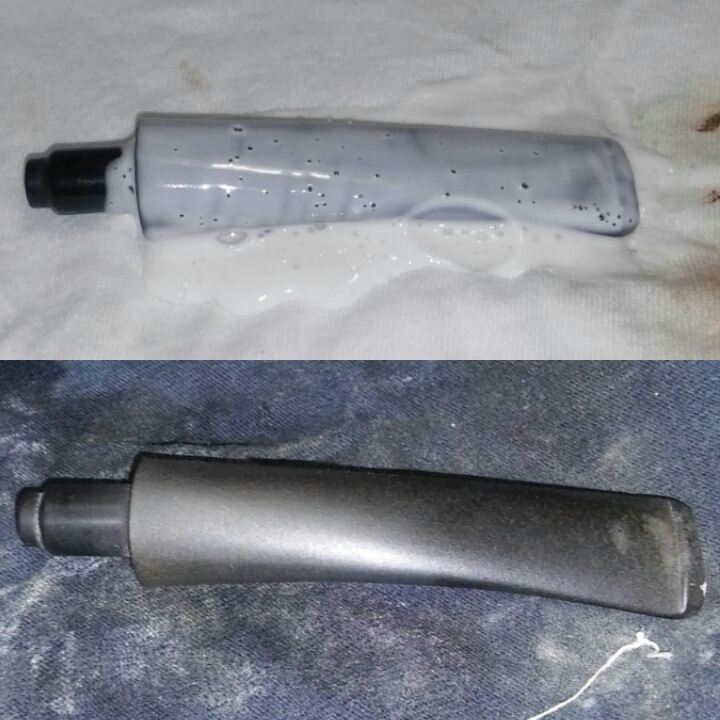 I stained the repair patch with a dark furniture marker allowed it to dry and removed the excess stain with an alcohol dampened rag. 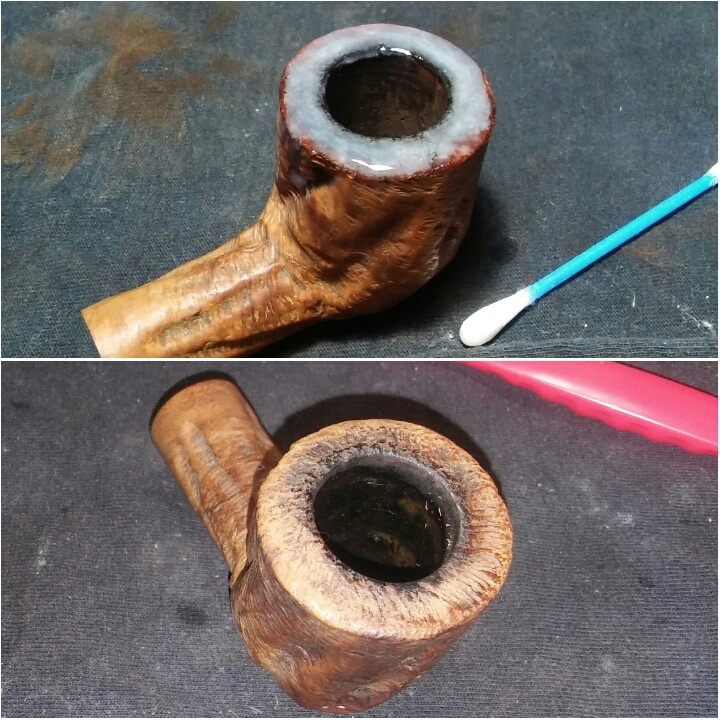 Now for the stem oxidation, I applied a generous amount of non-bleach Soft Scrub to the stem with a children’s toothbrush and set aside to penetrate the oxidation.Once the Soft Scrub turns from white to a brownish color its time to introduce the old elbow grease and scrub vigorously with a rag until the oxidation is removed. 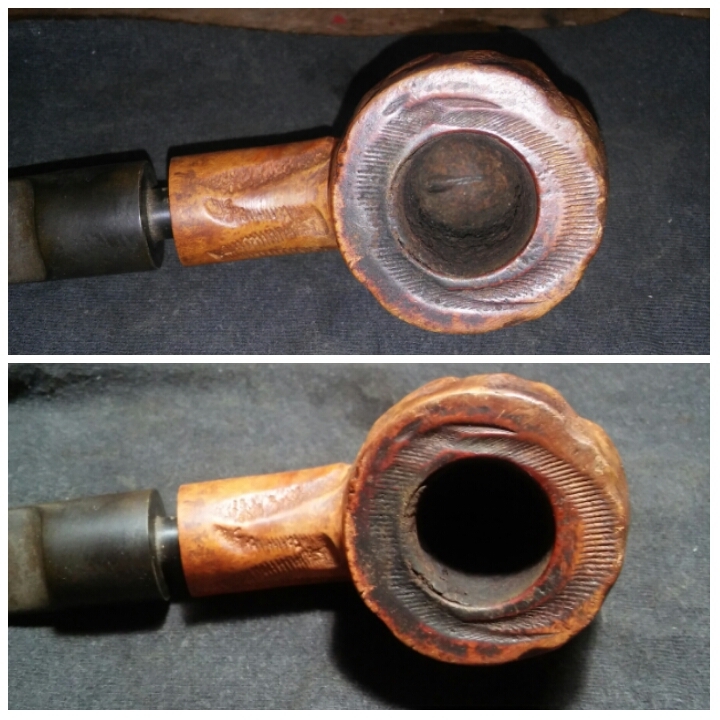 With the oxidation removed I could now run it though the various grits of sandpaper and micro-mesh pads. 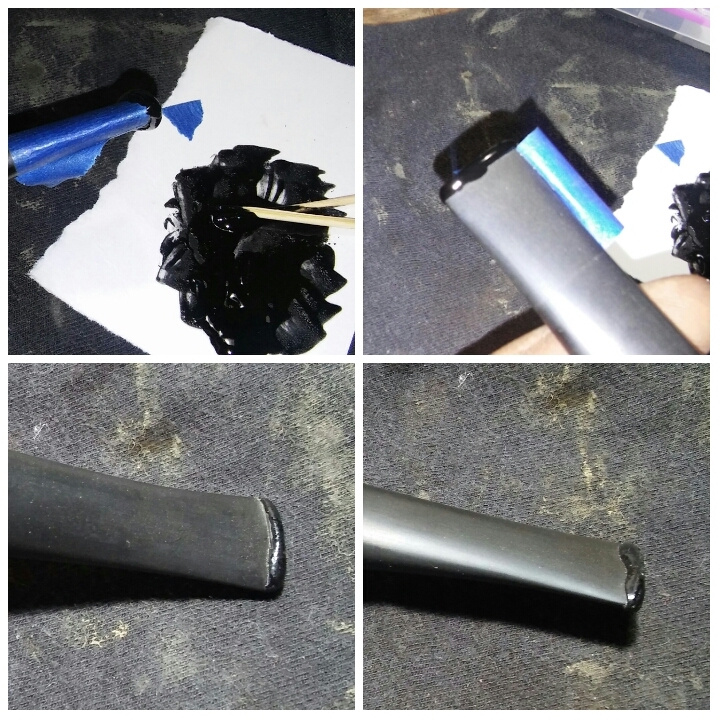 1000 grit sandpaper wet, 1500 mesh wet, 1800 mesh wet, 2000 grit sandpaper wet and 2400 mesh wet. 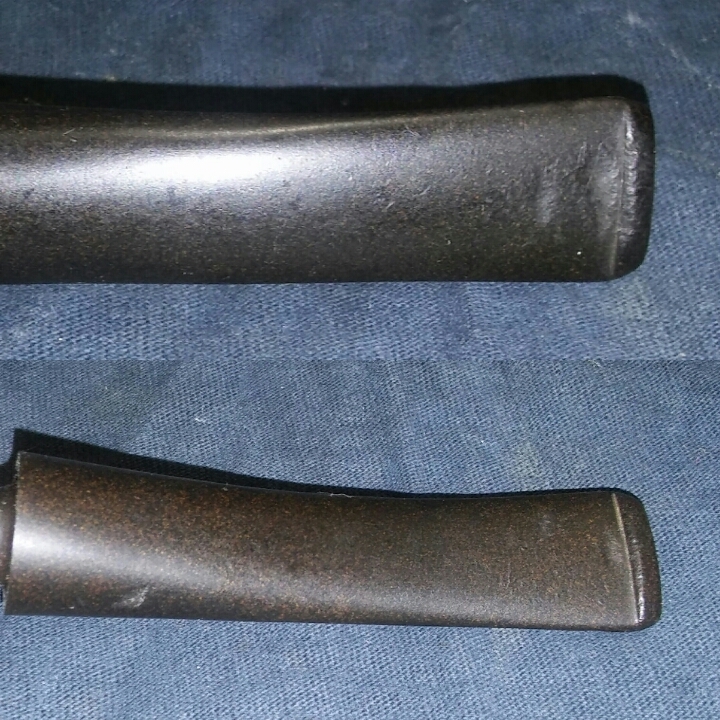 The remaining micro-mesh pads dry 3200-12000. 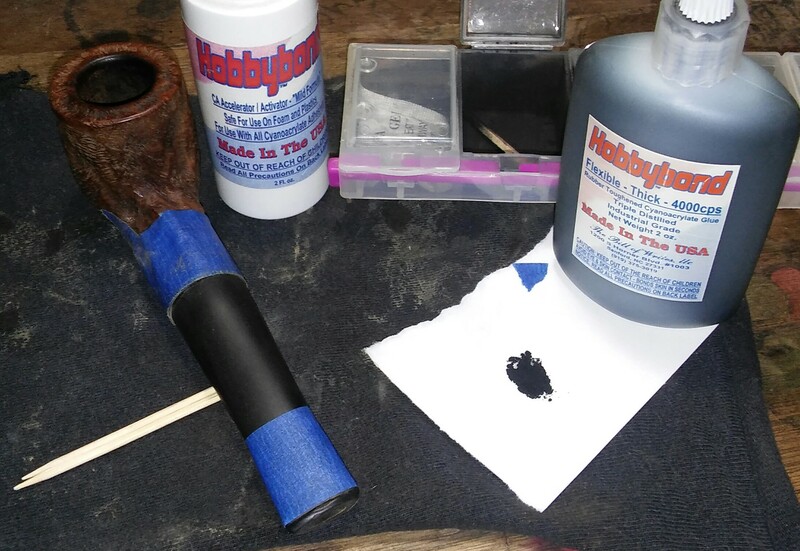 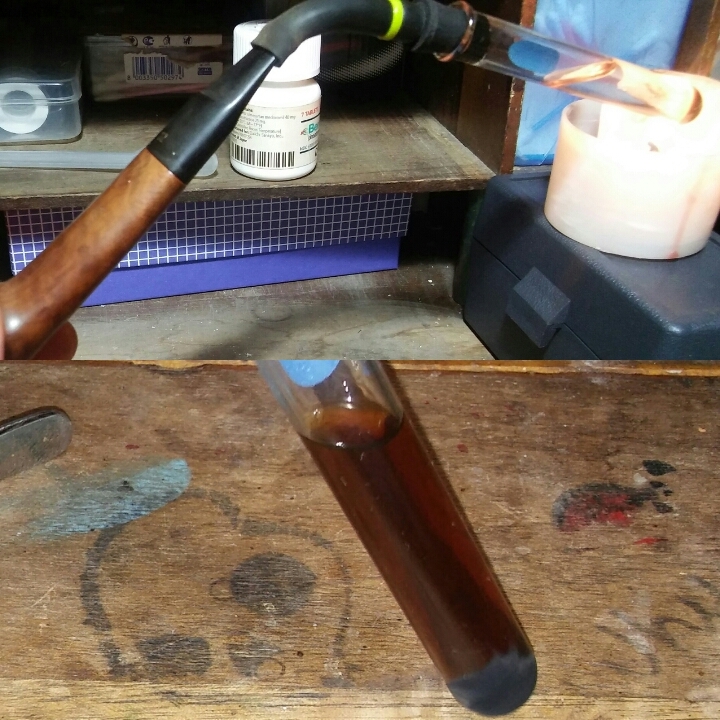 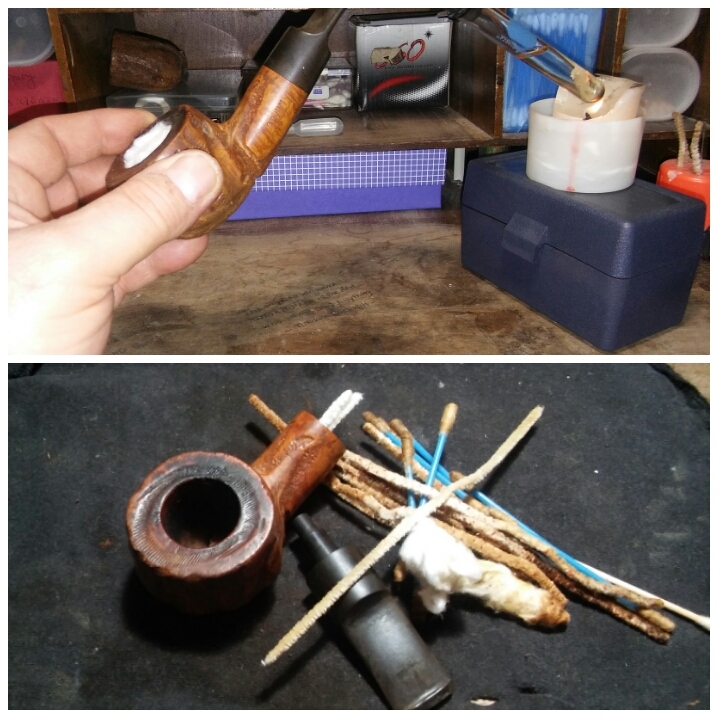 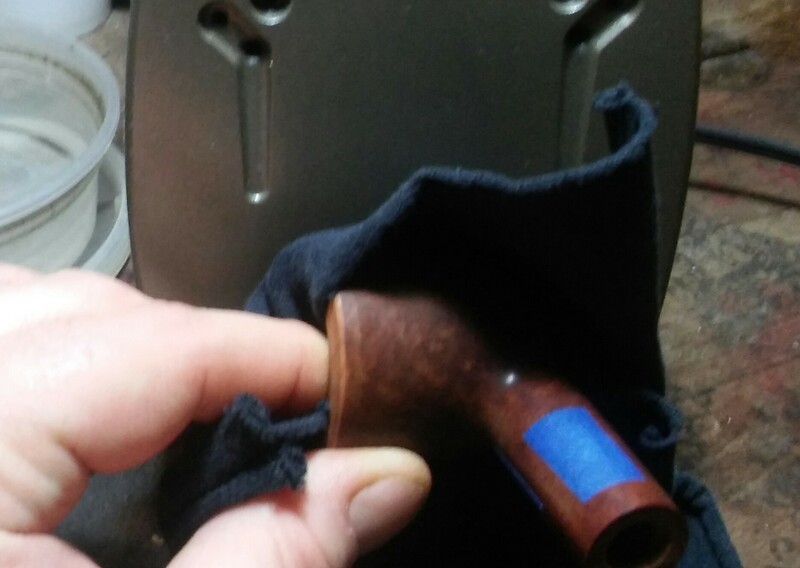 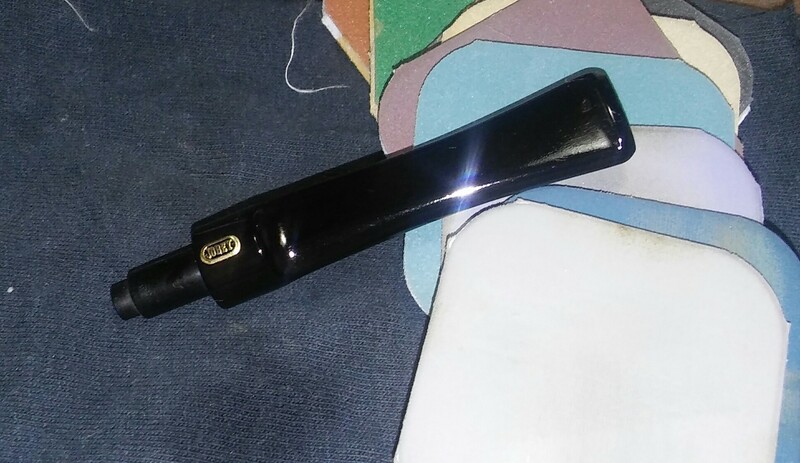 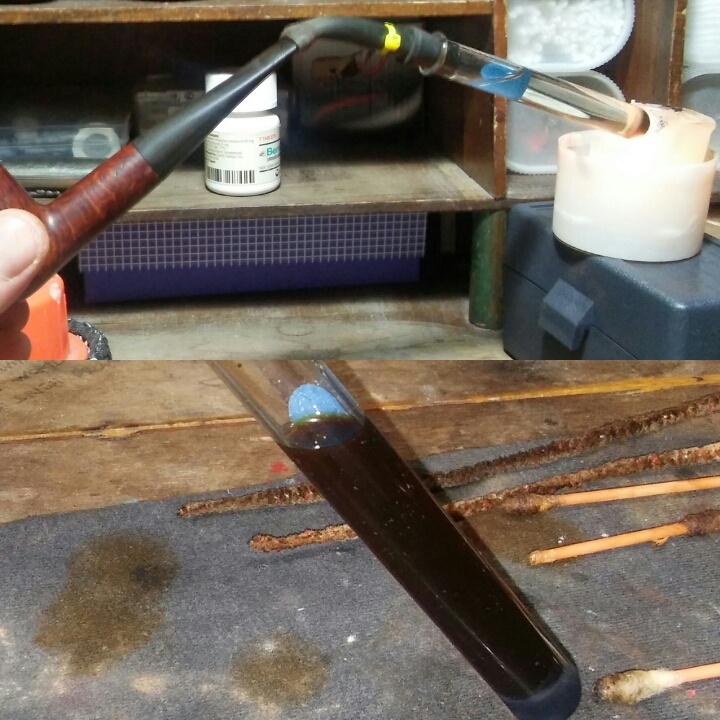 I don’t typically stain my Custom-Bilt pipes but I thought I’d give it a go. 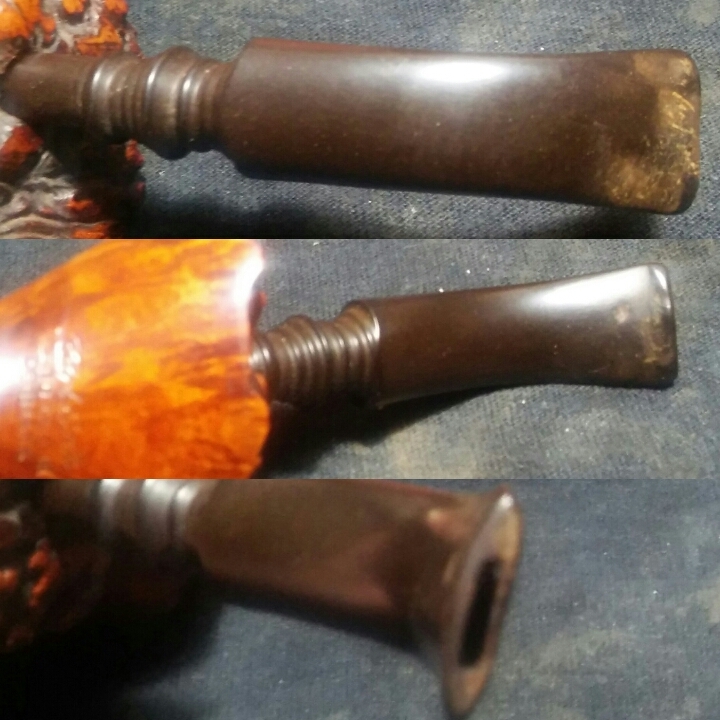 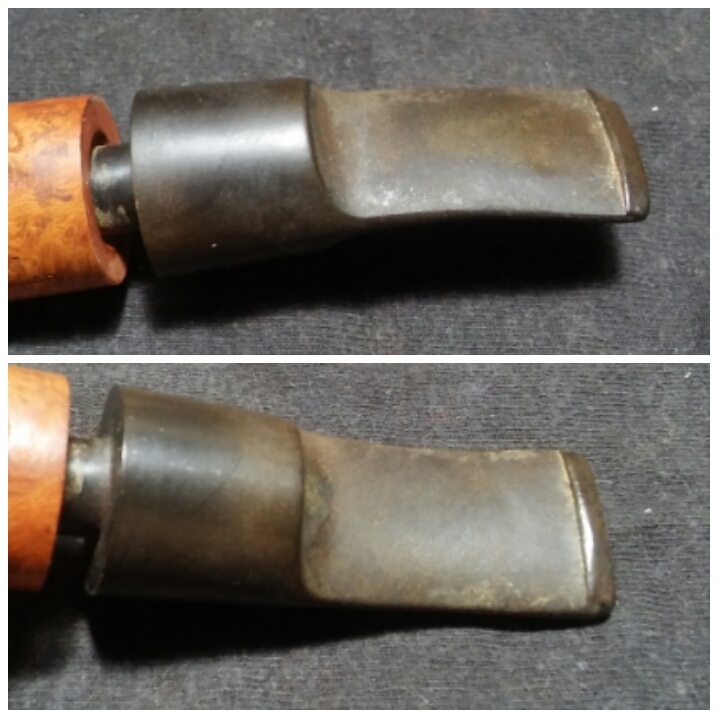 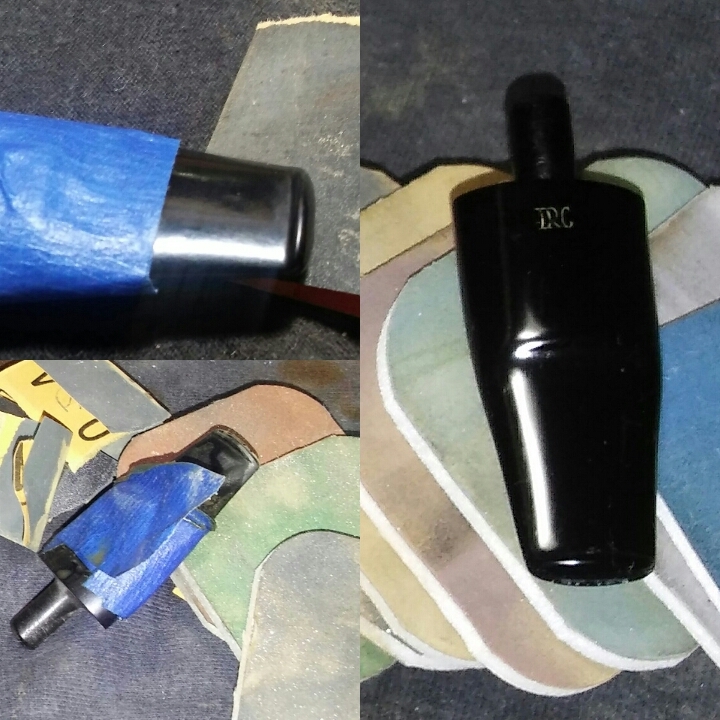 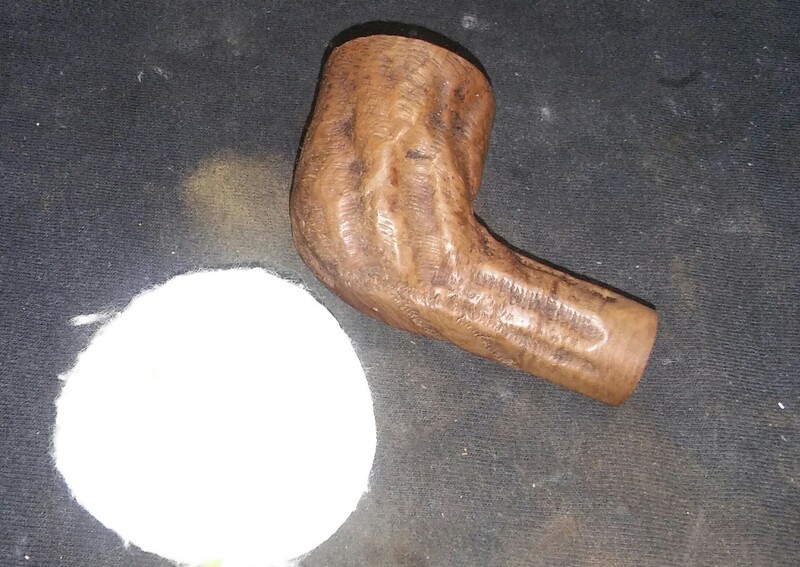 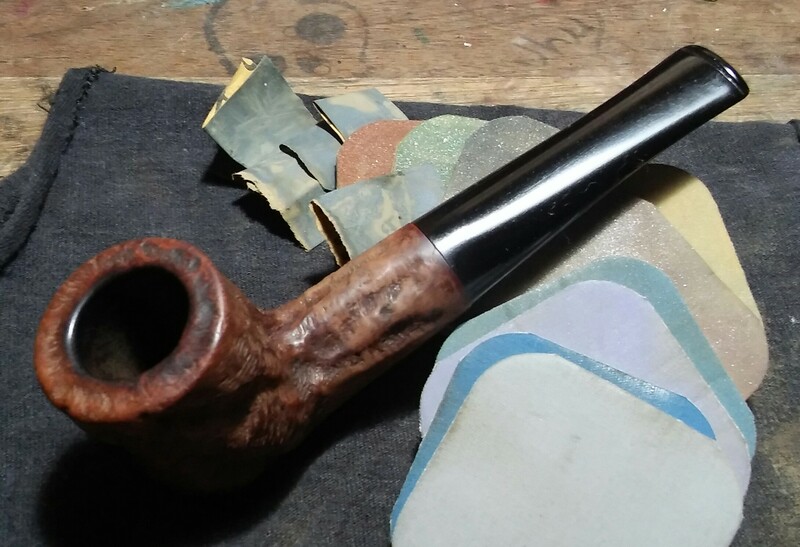 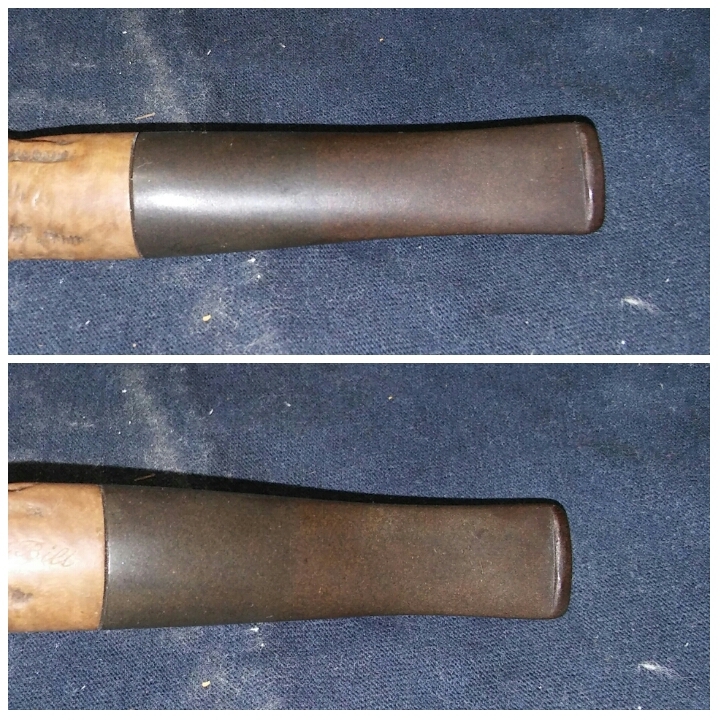 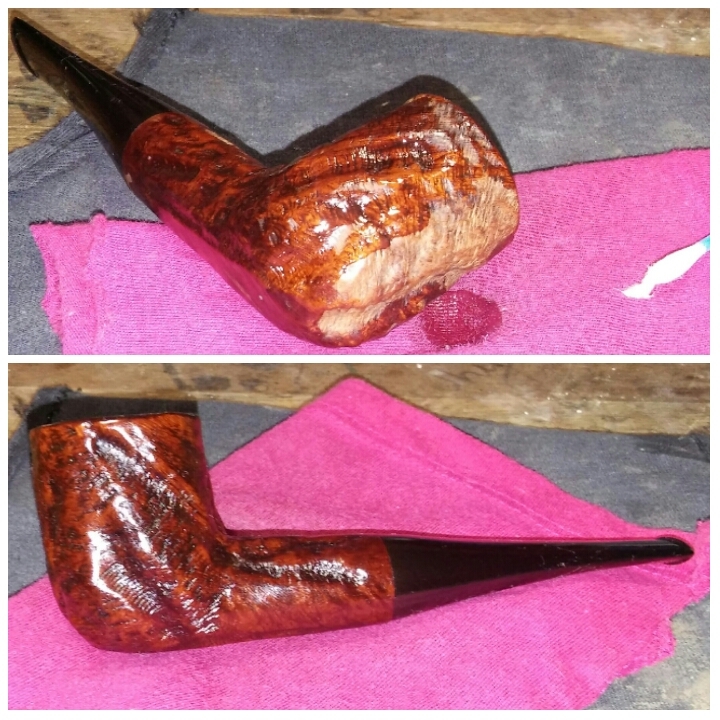 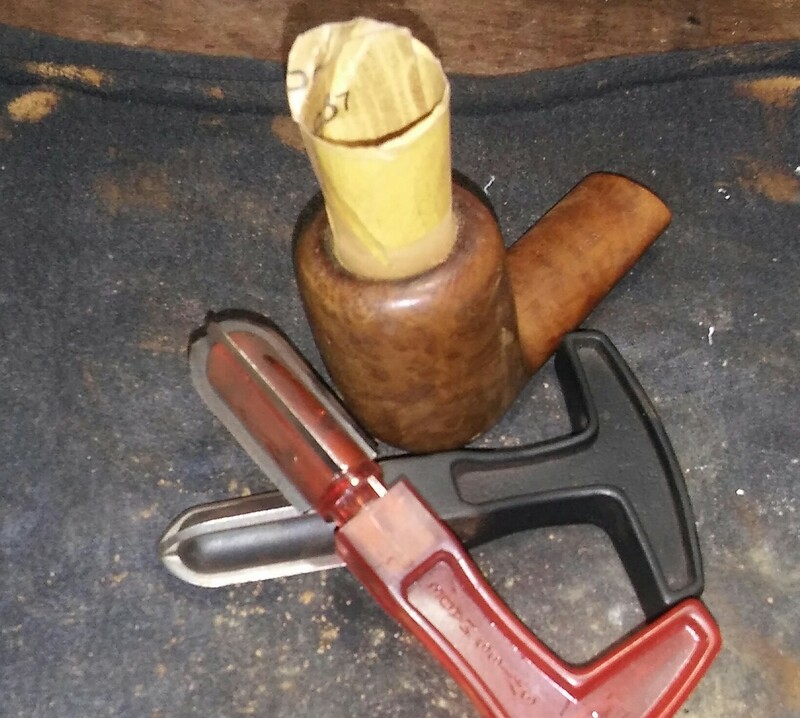 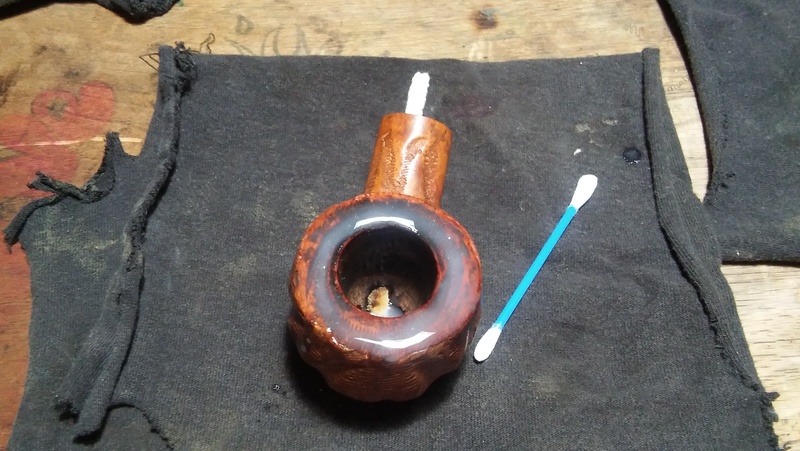 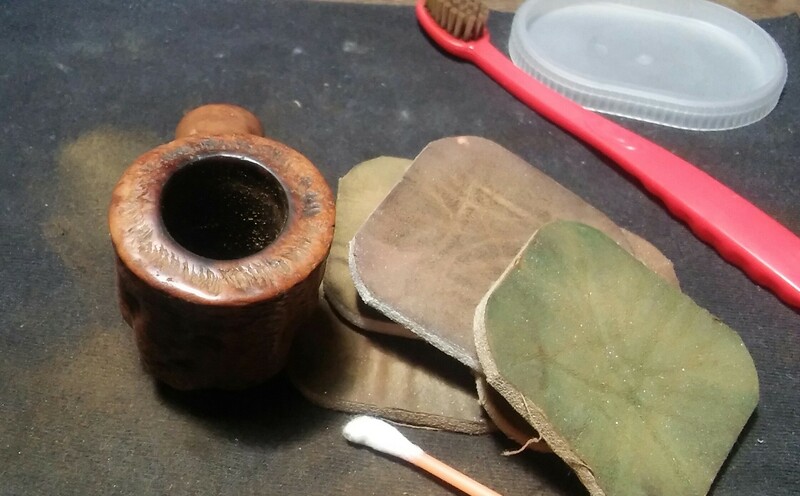 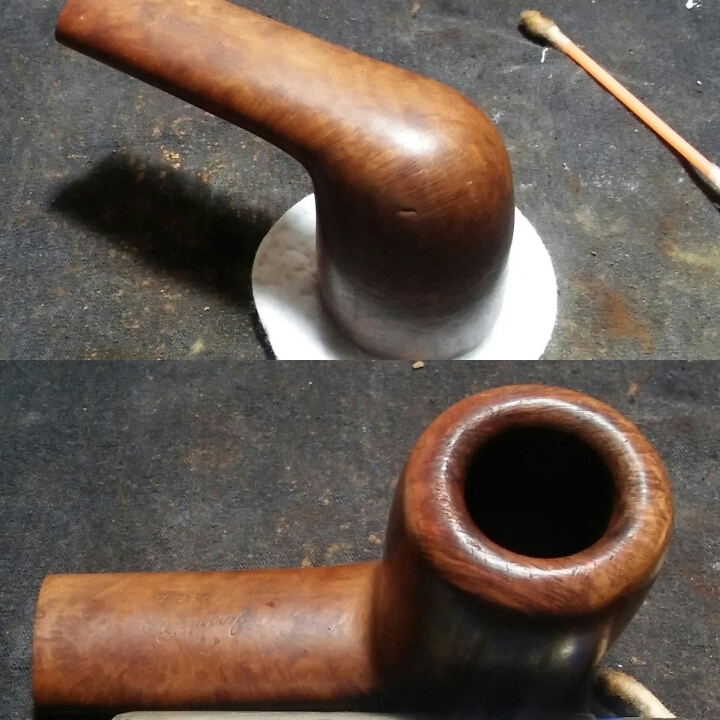 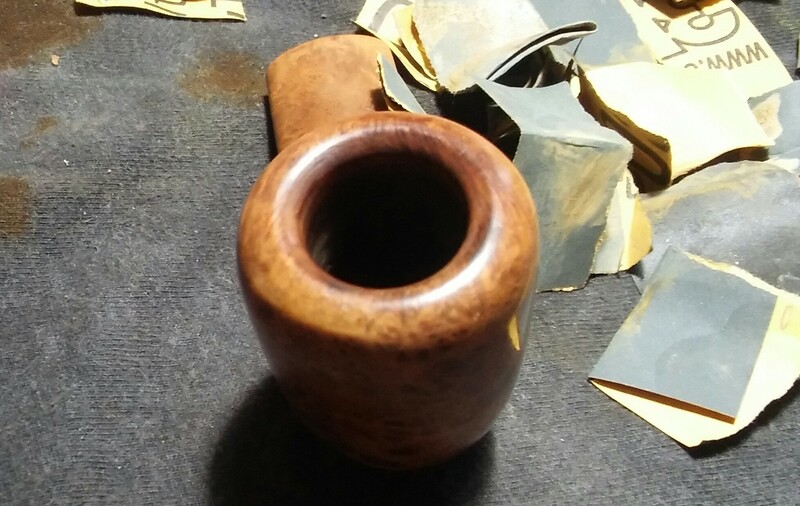 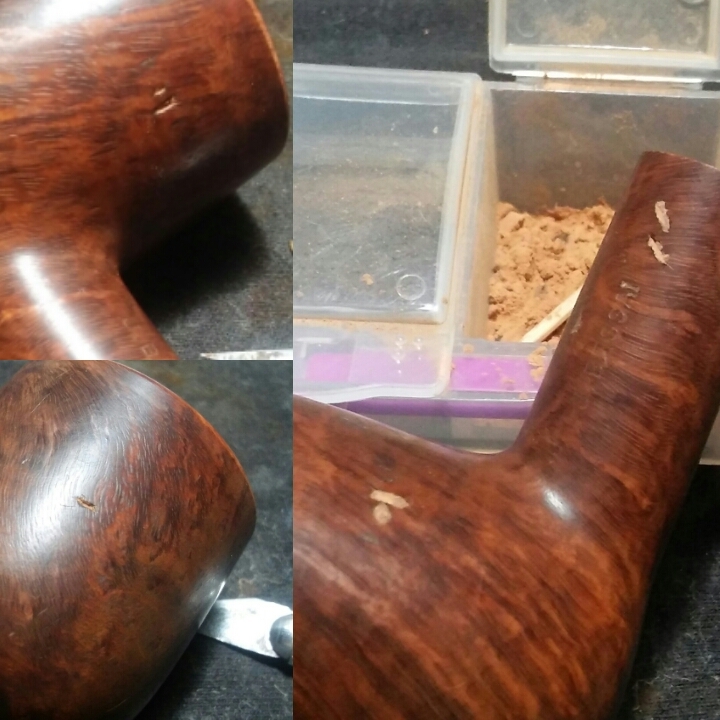 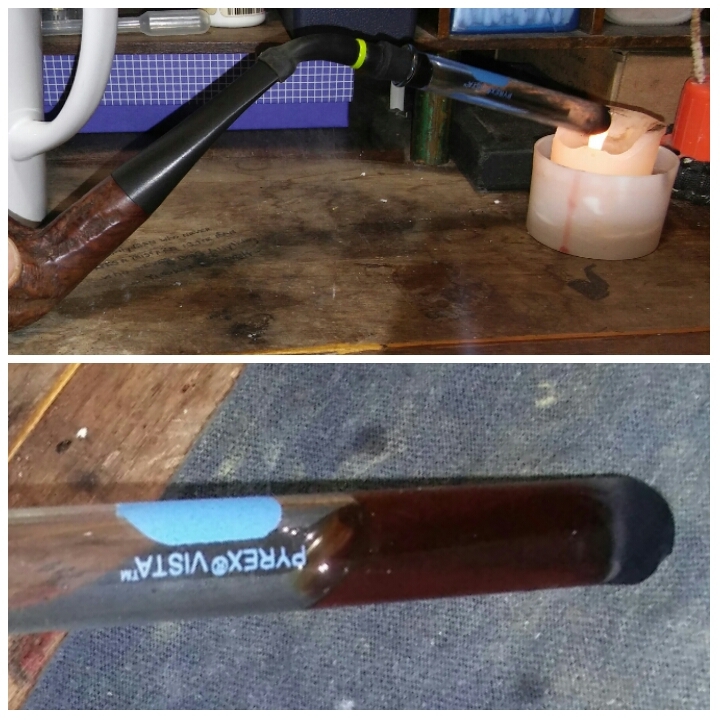 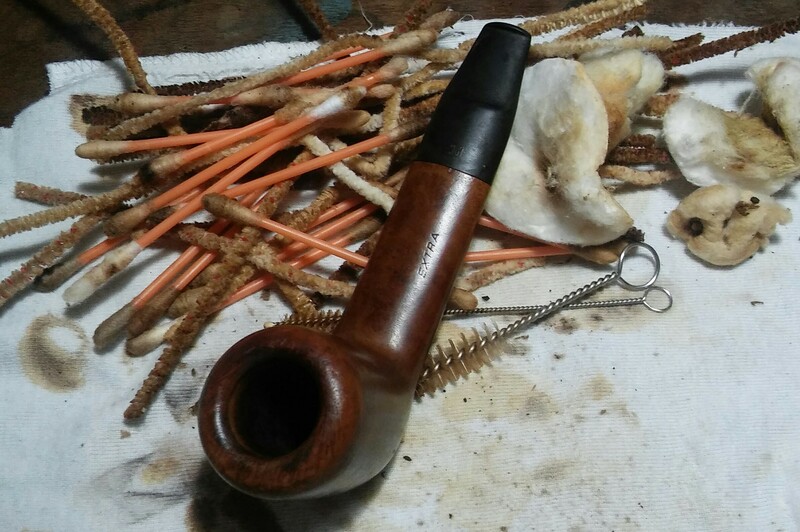 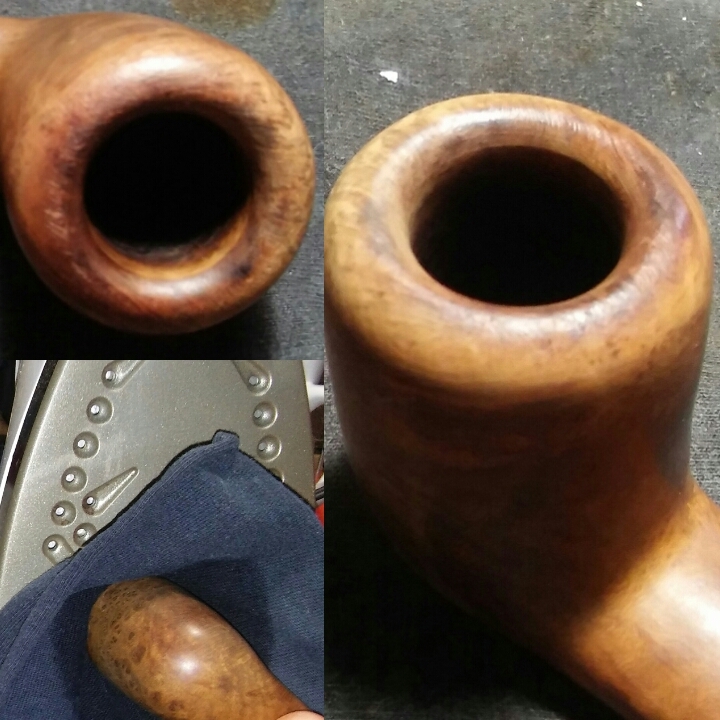 Using a dark furniture marker for the rusticated area’s of the stummel and a lighter color marker for the rest of the stummel, removing the excess stain with an alcohol dampened rag. 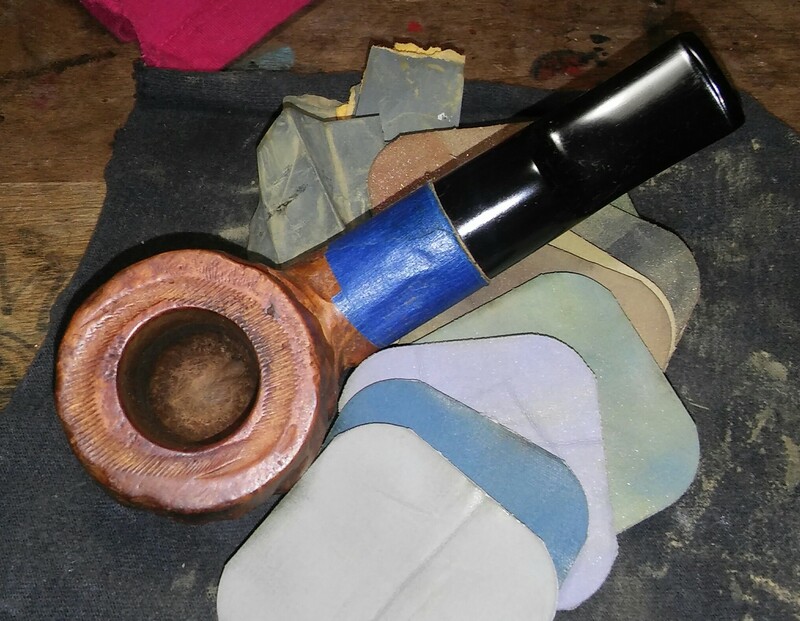 Finished her up on the wheel with white diamond, a few coats of carnauba and a microfiber hand buffing Buffing the stem with blue compound.